But our house here in Ecuador has no number, and out street has no name. Still, it’s no U2 song we’re living. Rather, we’ve settled in a house we love, a place that’s begun to feel like home, one where we’re reaping the rewards of no residential postal service and, therefore, no junk mail to clutter our counters, to litter our tables, desks, and drawers. Even better, it’s in this house our Cuenca adventure is being written. It’s here we’re being rooted, from here we’re telling a new story. It’s this space that grounds us in the present, gives us past places to remember and future spaces to anticipate. Sara and I have shared a number of homes—houses in four countries, three continents and one earthquake-ravaged island in a dark corner of the Caribbean, the poorest country in the western hemisphere. So when we decided to sell our house in the US and move to Ecuador, no one in either of our families was terribly surprised. Our parents, siblings, and friends were accustomed to us packing our belongings and trudging, two spoiled dogs in tow, to whichever corner of the planet had suffered the most recent natural disaster. So settling into a new home, far from the US, is nothing new to us. What is unusual in this instance, however, is that we’ve sold our house in the US. In the past we’ve lived overseas for a year at a time but maintained a residence in the States simultaneously. This time around we’ve uprooted ourselves completely, gambling on the rich culture, staggering beauty, and strong economy Ecuador has to offer. And in the past 8 months, as we’ve made a home for ourselves on a new continent, we’ve not been disappointed, not once, not even for a moment that either of us can recall. Since moving to Ecuador the first of May, we lived for a month in a short-term rental in the heart of colonial Cuenca, before finding a more permanent place to live a bit further from the city center, and shipping a container to Ecuador with all the things that make our house a home—our art, our books, personal pictures, and a few family heirlooms. As it turns out, we just finished celebrating our first Christmas in Cuenca, both with friends who visited from the US and the many new friends we’ve made since coming to Ecuador. 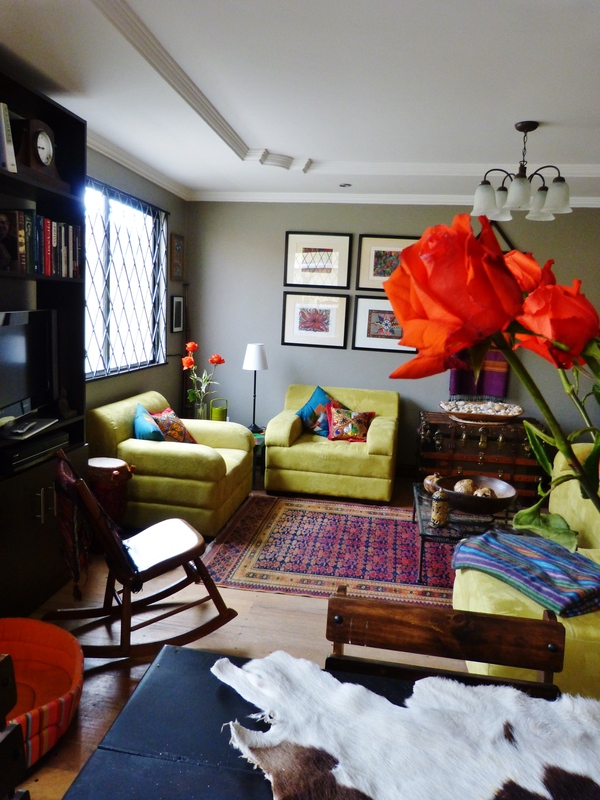 In honor of that and the fact that so many of you have asked to see photos of our home here in South America, I’ve decided it’s time to take you on a tour of the 4 bedroom house we rent in Totoracocha—a middle class, Ecuadorian (as opposed to expat) suburb—east of downtown Cuenca, south of the Cuenca airport, and just north of Monay Shopping Center. At our neighborhood Mercado, I buy 20 long-stemmed roses for $4. 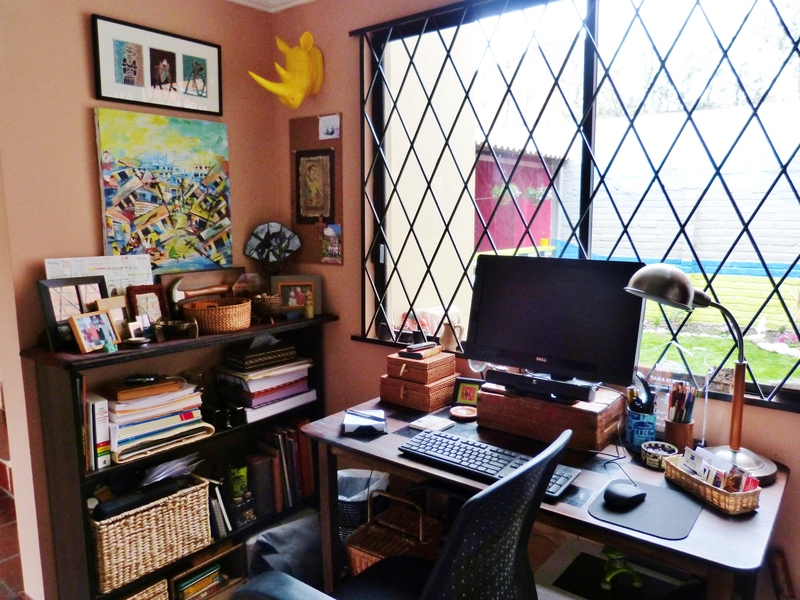 So, if indeed, home is where our personal stories get started, Sara and I are drafting a new chapter of that tale, and we’re doing it here in the Cuenca house where we’re now nesting. And this week, we’re feeling even more at home in Ecuador, since my 20-year-old nephew has come from the US to live with us for six months. 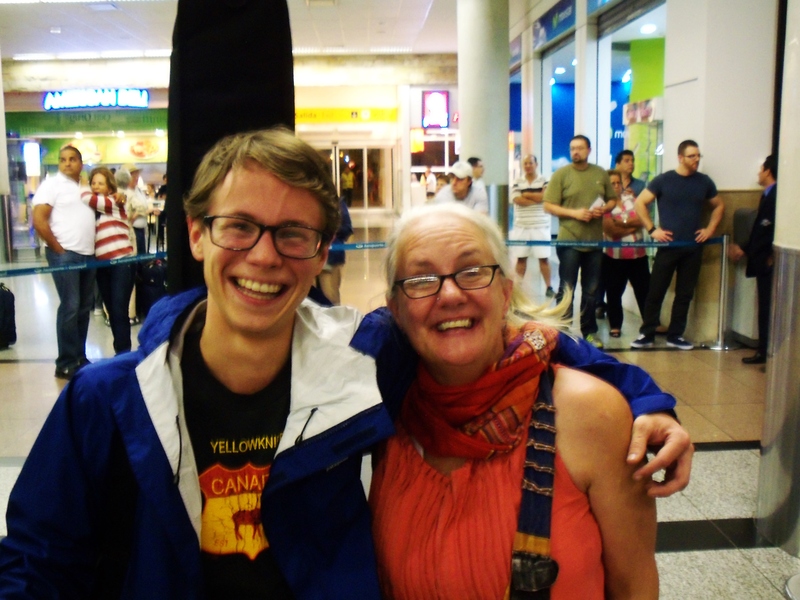 Johnny and Aunt Kathy at the Guayaquil airport! 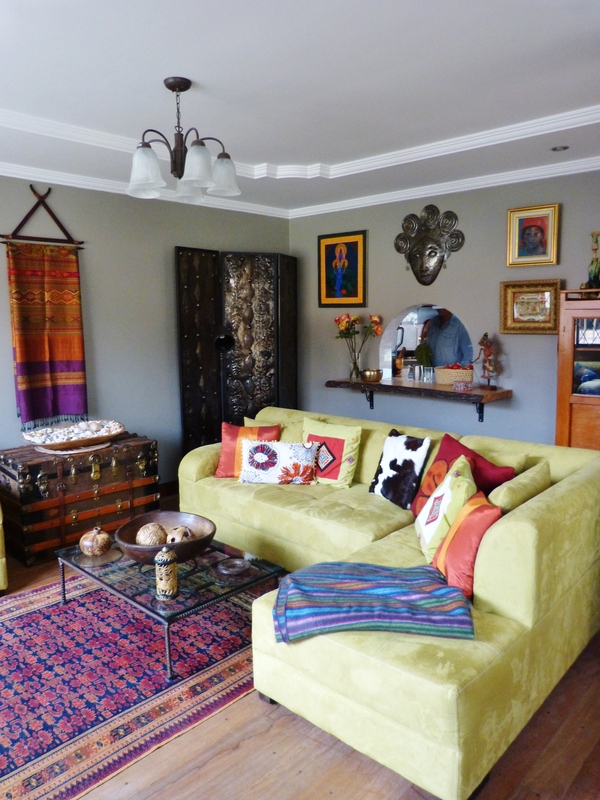 Johnny’s arrival, the presence of actual family in our new country, makes Cuenca feel cozier and more comfortable than ever. Where do you feel most at home? What’s the place you feel most rooted, most grounded? Does your current house or apartment feel like a place you’d like to permanently live? 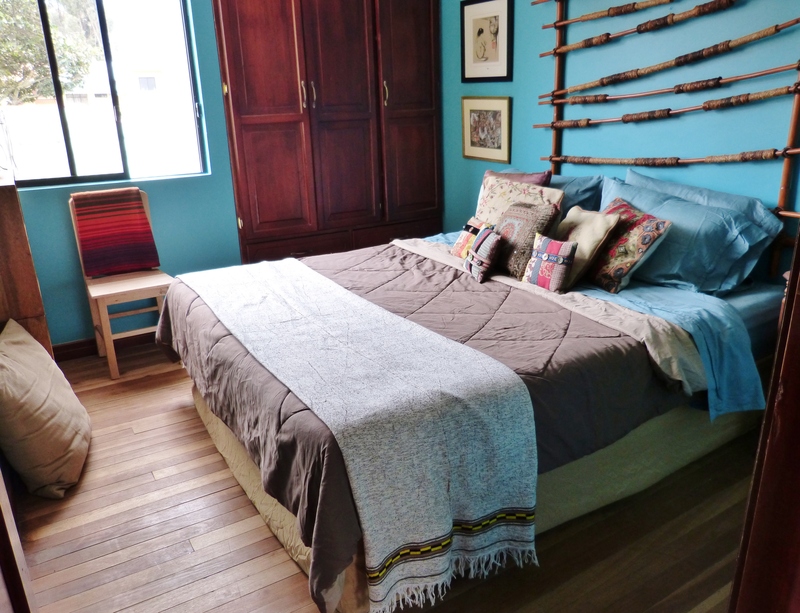 This entry was posted in Ecuador, home and tagged affordable housing, Cuenca, decorating, design, Ecuador, family, home, housing, interior design, interiors, life, photos, style. Bookmark the permalink. Love the house- and am impressed with your organization techniques! I took several screen shots. Love to y’all!! Love to you, too, Emily! So glad you enjoyed the organization. I suspect you’re referring to all of the jars in my studio. 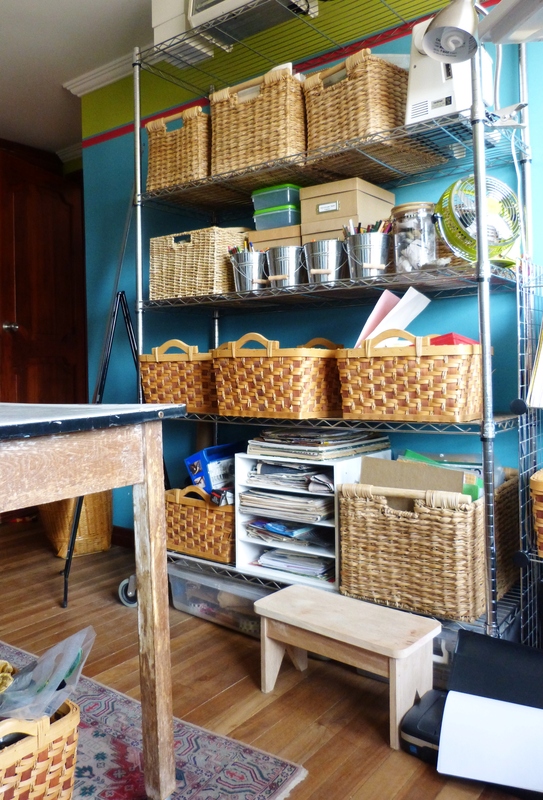 When you make the kind of art I do, you have to be organized or your work space becomes too chaotic. Hope you all are staying warm, and avoiding road trips with Offspring #1 as driver! SPLENDID! One question: Why do we drag hundreds of books with us every where we go? My kids keep asking me to thin out my library.. I tried once; think I disposed of three. Those books are some kind of symbol, arent they? Like magical tours ingested 10, 20,30 40, even 50 years ago; stuff we still have inside ourselves; stuff that was the mortar of our evolution. I’m glad to know I’m not the only one who does this. I thought I was crazy but now I know I’m just in GOOD COMPANY with others who do the same thing. Glad we’re not alone either. 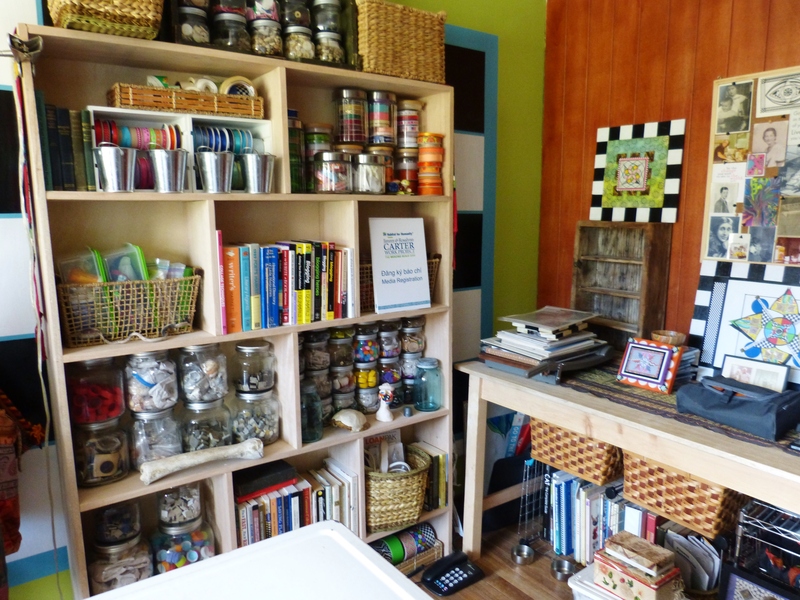 We can’t get rid of our books, try as we may–books and art–that’s mostly what we moved in our container. Yes, they become a part of us. And you have said it SO beautifully; it is a magical ingestion, so to speak–a transubstantiation of the literary kind. WONDERFUL to hear from you, my friend. WHEN are you coming to visit? Our guest room has your name on it! Hi Cathy and Sarah! I love your blog. The photos are so rich, warm, and inviting. The courage of you two to up and move is very inspiring. I love, love the books! I look forward to following. I up and moved to a new state and come close to relating to how you feel. I hope to try it again. I love my temp rental right now, but no it’s not perm. I am excited just looking at your photos and reading your blog. Looking forward….God is good! Thank you so much. It’s wonderful to hear from you today. Glad you enjoyed the tour of our house. Glad you are enjoying your new home, as well. We are, indeed, blessed! I appreciate your stopping by and taking the time to leave a comment! Yes, books that one has accumulated over the years are often difficult to part with. When I left Hawaii after living there for over 20 years, I boxed up 30 boxes of books (mostly academic/scientific) and had them delivered to the Junior College in Majuro in the Republic of the Marshall Islands. Since they were lacking in marine science books and were attempting to establish a makeshift library (sparse as it was), I was certain they would be put to excellent use by the local students. This made it so much easier to part with these cherished books on my mind and has left a mental picture of contributing to these students education with me. Pass them on you will be pleased you did! Oh, how wonderful that you passed along your books to a library. That’s the perfect solution, isn’t it? LOVE your story and giving attitude. I suppose that means you were an academic. I was, also, in a former life. Great to hear from you. Thanks for your comment. Hope you’ll come by again soon! Absolutely gorgeous place, Kathy. 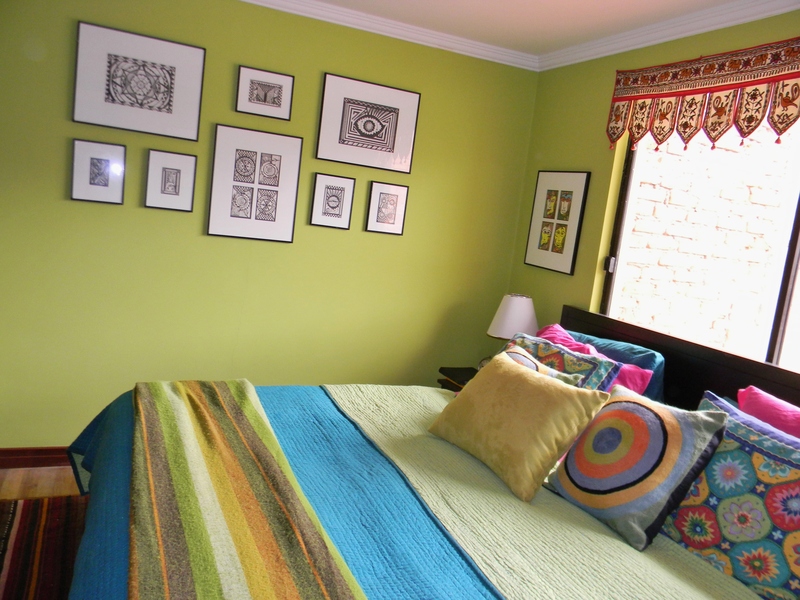 I love all the bright colors and it really does feel so cozy! Can I move in with you? Thanks, Darla! We love our house. And it’s still amazing to us that it rents for a mere $350 a month. Ecuador makes us feel rich. You are welcome any time! Next you gotta meet South American bloggers in person! Right? Such a lovely feeling to your new home already 🙂 _ I noticed that you do not have many window coverings and that there are buildings close to you – can people not see in? Thanks, Jackie. We love our house. We only wish it had a view of the Andes. Our next home will. Yes, not so many window coverings. We don’t care if folks can see in the main living areas, as we aren’t the type to run around naked or anything. 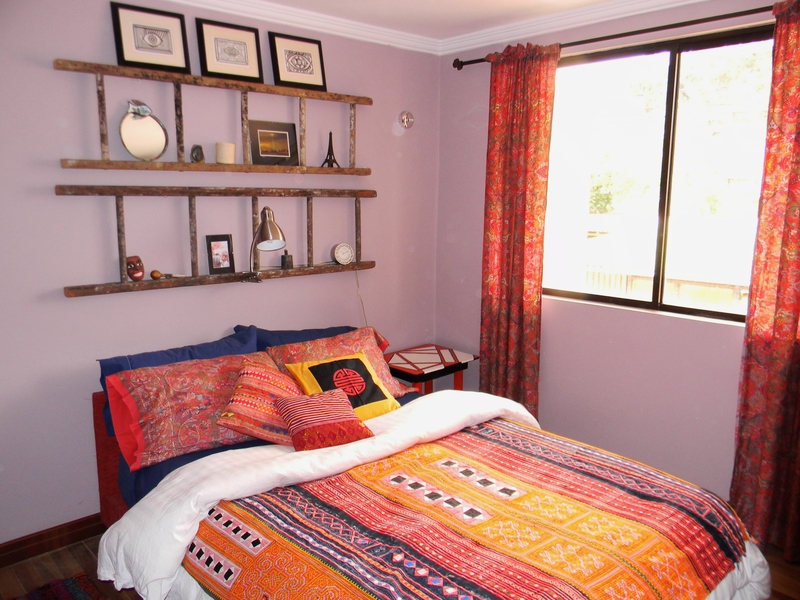 Since some of these photos were taken I have made some curtains for one of the bedrooms. Still working. Hard to find window coverings that fit, so I’m doing them myself. Thanks, Jackie. You’re a sweetie!!!! Loved the guided tour. The cost of living is incredible. Your home is comfortable and inviting. And the books. I love books. I wasn’t surprised about the books since you are a writer. I just to see books displayed. I always read the titles as an indication of what appeals to you. Books say a lot about a person. Life is expensive here for a lot of reasons which include importing everything. What doesn’t exist as yet is significant taxes. The Hague pays for almost everything. Yes, yes, yes! Fun to look through someone’s library, as it is such a window into who they are. Excellent point. Plus, yes, I love to see books displayed, as well. That’s one reason we decided to ship a container, as we couldn’t be without them. Fabulous that you all don’t have taxes yet, as I hear they are high in the Netherlands! The majority of people here try to work for the government. Other than the government you work at a small hotel, restaurant etc. In 2010 we became a city in The Netherlands and Holland is slowly exerting itself. If we want the benefits we need to pay. Holland has been footing the bill but we all know in time that will change. Regardless of what happens we’ve decided to make this permanent. If not here I know I do not want to return to the US. Yeah, that sounds inevitable, but I’m sorry for you all. Taxes will make a big difference, I imagine. And like you, we have no desire to return to the US! There were four or five founding families on this island and when they arrived they split the land among themselves. There are huge tracts of vacant land belongs to these families and they do not pay taxes. Everyone believes it is only a matter of time before real estate taxes are put into place and these land owners will be the first to be hit. The island is too small to support itself and there isn’t any competition because the island is too small. Yes, that makes sense, about the size preventing the island from being self sufficient. I’d LOVE to read a post about those founding families and the vacant land they own. That would make for fascinating reading! You have to be careful what you say here cause the island is so small everyone knows your business. No matter how long you live here we are outsiders but I will attempt to perhaps find away. Interesting. Hadn’t thought of that. Well, if you figure out a way . . . You know me, I’m always in! I am working on my content again so I will out in on the list. BTW, I really enjoy our exchanges. Colin, I LOVE our exchanges. Can’t wait to see what you come up with! Hope you’re having a great day! Your home is lovely and your story inspiring. Thank you, dear Robert. How are you? Are you staying warm? 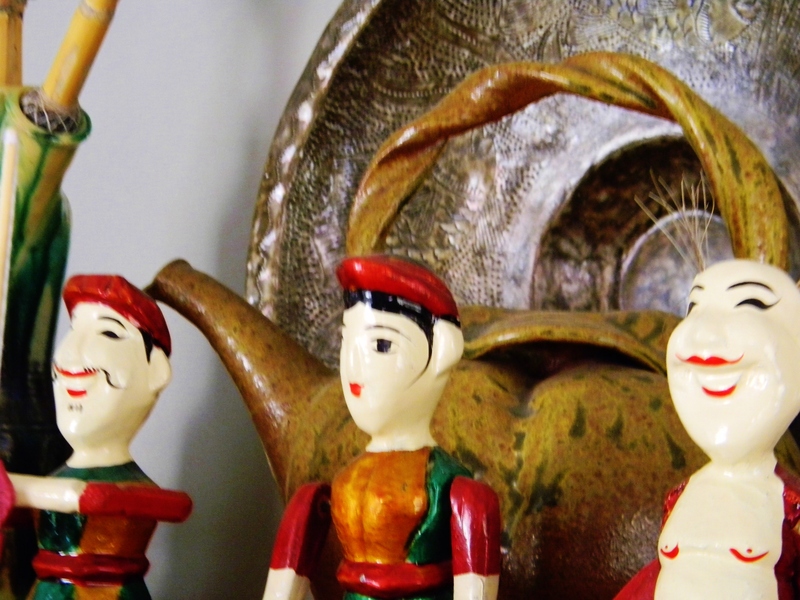 Are you finding any flea market treasures? Glad you enjoyed the tour! Take care, my friend! Could I become your new niece and stay a while? Your home looks lovely. It’s said that “home is where the heart is,” so I have to wonder….my house is okay, but it is just a building. I feel like I have wanderlust flowing through my veins. Yes, we are looking for nieces to “adopt,” as neither Sara nor I have any in our families. All of our siblings have boys. Seriously, I’m so glad you enjoyed seeing our home. You should try visiting Ecuador. We’d love to introduce you to our adopted homeland! 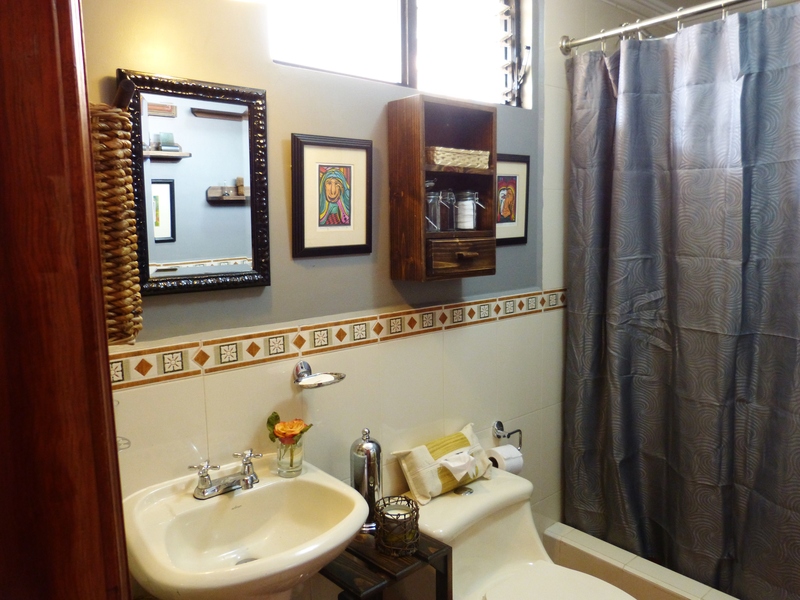 I am sending HGTV to document and photograph your house! Amazing. 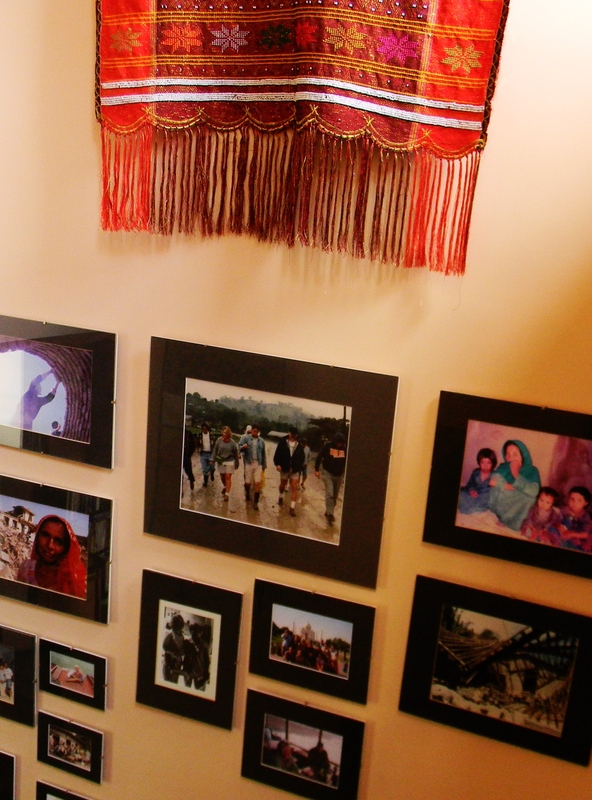 Culturally beautiful with your world travel collections, of art, fabric, colored to capture the essence of each space… your art looks wonderful throughout your home. During my reading and viewing I was imagining myself there! Wow! You ladies have done well! Oh, Jeff, thank you! You are such a sweetie! When you are able, we would LOVE you to come visit. I know it may be a while, since you have to care for you mom, but one of these days, we hope you will come visit us in Ecuador. And I am SOOOOOOO totally serious, my friend. Hugs to you, too! Great to hear from you. And stay warm! Oh, Laura, how great to hear from you today! We LOVED having you and Clay at Christmas. There were SO many people, it was hard to see the space. Exactly! Hope all went well on Sunday. We were SO disappointed we couldn’t come. Meeting went well. Love the U2 reference at the start (and I don’t think I’d have spotted it if you hadn’t pointed it out!). 😉 Your new house is amazing – I love every colourful room…and the patio…and the garden! 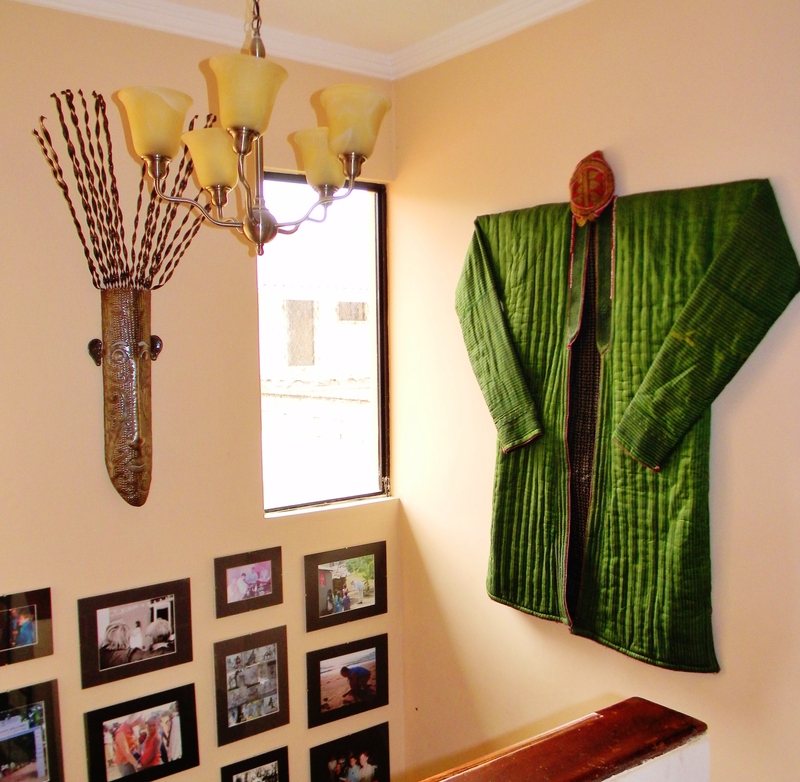 My house-dressing sense is even worse than my body-dressing sense. I think it’s because I don’t really have any great attachment to a home or stuff…something that would be completely obvious if you walked through my front door! Maybe one day I’ll find my spot, but for now I pretty much feel grounded wherever I lay my hat, which is right beside Mr Warm Ginger. I will CERTAINLY pass along the greeting to my nephew. He IS such a sweetie, and WE are the lucky ones–to have him here. I’m like you, in as far as, I feel at home wherever Sara is. 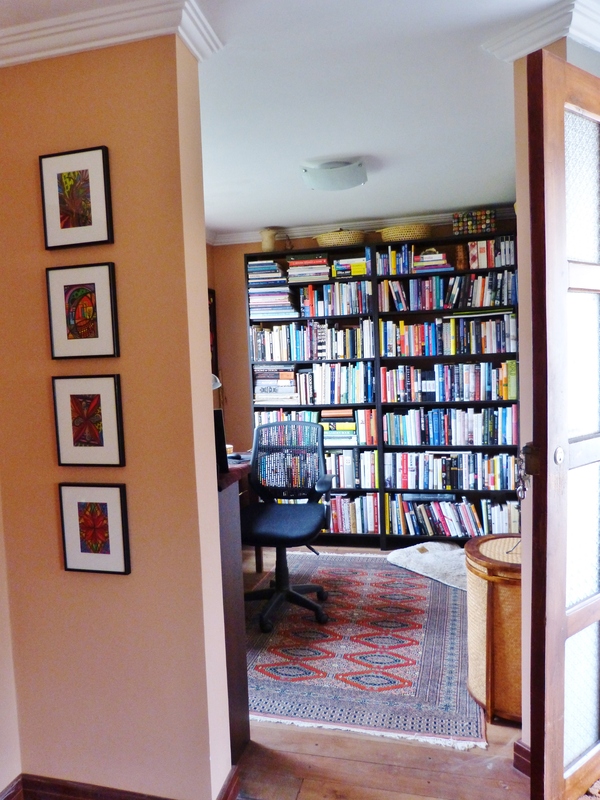 Still be like having our books and art–and our dogs, of course. Plus, how a place is decorated is NOT what makes a house a home, right? Hugs to you today. I LOVED your post today. I shared it on twitter. Thanks for sharing my post. I know I said this the other week, but I must get round to sorting out my social media! Don’t have a smartphone though, so although I’ve got a Twitter account, it’s laying dormant. Nephews are special aren’t they? I can’t wait until mine are finished with school and can come and stay with me for six months! Yes, you mentioned the social media stuff, but I’m with you–still trying to get my brain around it and do the work. I have only had a twitter account for a year, and have only in the past 4 begun to use it. I don’t quite get twitter. I was hoping he’d do a guest post or two on your blog, and as he’s a writer I guess you won’t be able to spot him. He’s lucky to have such good lineage! Interesting idea! I hadn’t even thought of him doing a guest post. Will ask him about that. We are sitting here in southwest France freezing, no money to enjoy the beauties of Europe, it all costs too much now. Our 200 year old farmhouse, our home for 18 years, is now on the market and my British husband and I (American) are going crazy studying all the possibilities for our final home. We lived/worked in the Middle east for 20 years, and now in our mid-60’s, are up for one more big adventure. Reading this wonderful article and seeing your pictures have made the decision for us, compounded by what we have been reading the last year on Ecuador, there really is no other choice. My husband lived in Mexico long ago and is fluent, Why did we even consider anywhere else?? Thank-you for publishing your album! Bless your heart. I know Europe can be expensive. If you have lived internationally for that many years, I suspect, Ecuador, will be wonderful for you. 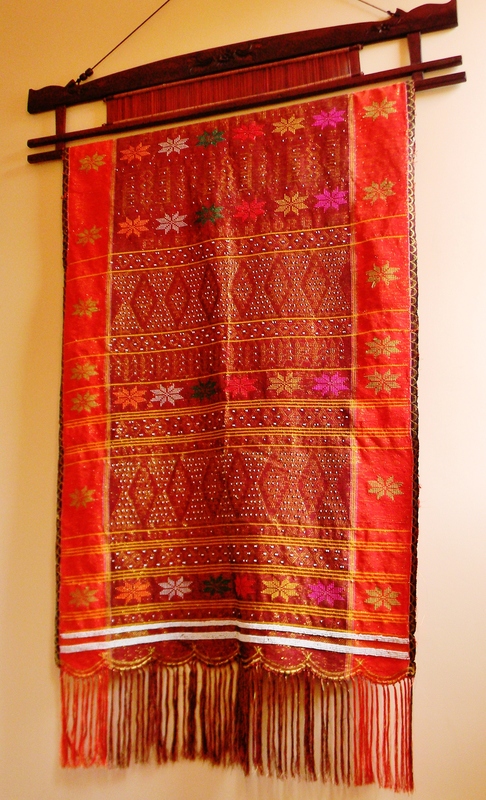 PLUS, it’s SOOOOOOO affordable–and beautiful. Give it at go. And let us know when you come to visit. Great to hear from you today. Thanks SO much for reading and taking the time to leave a comment! I’m so happy to hear from you this morning! Ecuador is SO incredibly lovely and has a huge variety in climate. The beaches on the cost are amazing and warm–like you would find in south Florida, for example. The Andes, at this elevation, means perpetual spring. Love about 50 every night–highs in the low 70s. Of course, the Amazon is much more hot and humid. The Galapagos Islands are gorgeous–though we’ve not been there yet. Try visiting Ecuador, if you are looking or an affordable and gorgeous place to live. We work but make very little. Sara is an editor for a local, English language newspaper and I’m a writer. Thanks so much for reading/looking and taking the time to leave a comment. Hope you will stay in touch! Yes, it’s worth a visit, when you have the chance. And that’s the way we felt when we returned to the US from Haiti. It was good to be home for a short while, but then we got the itch. Looking forward to checking out your blog. And cool that you will soon be finishing a novel. I’m working on a memoir, but have not tried fiction—YET! Hopefully, that will come. I wonder if one can ever be cured from wanderlust! I’m not even sure I want to. But I need to find a way to support my travel itch without resorting to teaching ESL, which is what I did in Oman for two years and in Korea for one. The first draft of my novel is finished and I’m working through the first revision, only 10 more chapters to go. Your memoir sounds fascinating! I look forward to following more closely to catch up! Interesting that you don’t want to teach English any more, and I wonder why. I’ve never taught outside of the US, so I’m curious to know the downside–long hours, poor pay? At any rate, I’m thrilled to hear from you. Hope you are having a great week! Well, Kathryn, I had the unlucky circumstance of teaching at the University of Nizwa. The pay abroad for teaching is much better than in the States, and so I had no complaint about that. UNIZWA was difficult because of the power-hungry, dictatorial administration, and the students who are very entitled, spoiled and act like middle-schoolers. I really wanted to teach at university level because I wanted mature students eager to learn, but this was not the case where I was. So mainly, it’s the classroom management issues I dislike. I didn’t really have long hours or poor pay ABROAD, though in the US, teaching ESL, I had both long hours and poor pay! Thanks again; my week is going pretty well, but I need to focus more on my work and not be so easily distracted. I hope your week is a good one too! Thanks for sharing. I’ve always wondered about the pay. with slow internet, only a small percentage of the images loaded, but there were enough to make my jaw drop more than once!!!!! i’m so happy for both of you – you have an amazing home with enough space to have an elite boutique b&b!!!!! 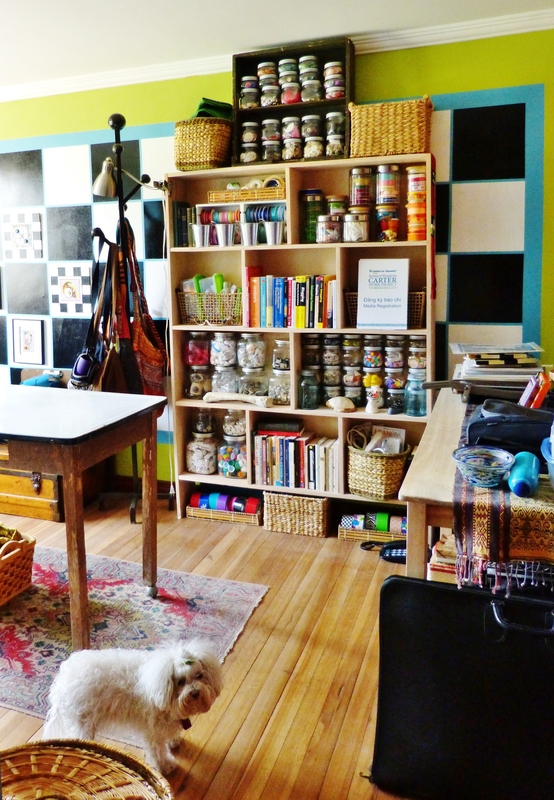 one of the images that loaded gave a great peek into the creative studio, all orderly and ready for projects. it made me want to dash downstairs and tidy my paints! great post, and i’ll be back to peek again when i’m in town on faster internet. Oh, Lisa, how wonderful to hear from you this morning! I’m tickled to death you liked our home. So when are you going to come visit?! I know you may already have friends here you stay with, but we would SOOOOOOOO love you to stay with us, if not. Please know you are always welcome. Just tell us when you’re coming. No need to wait for a specific invitation. We can make some art together!!!! thank you, and yes, that would be fun.. i’ve been pondering a five-day workshop – or maybe a three-day one and need to talk w/the museum folks… i’m not sure when i’ll be able to head to cuenca, but i will definitely give you as much warning as possible! Excellent news! Which museum do you work with? 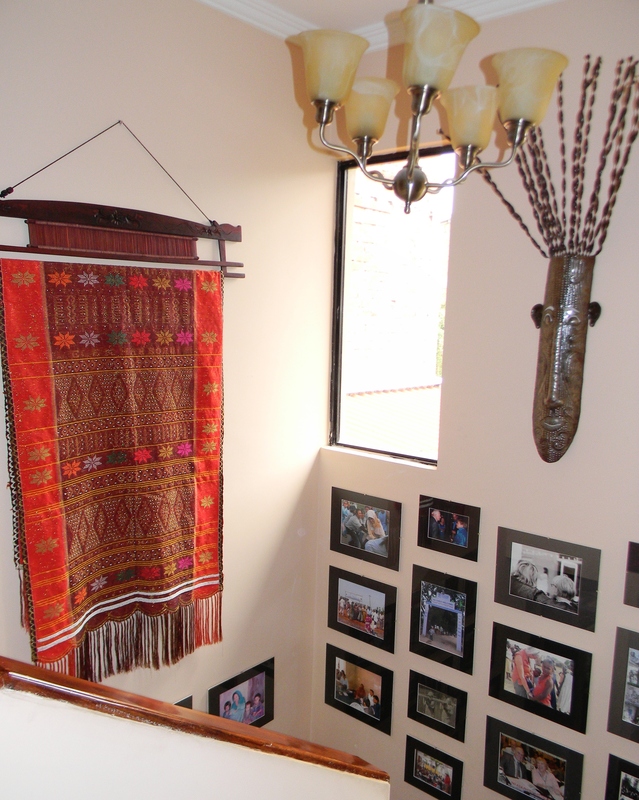 in 2012 i had three shows through the museum systems in manta, portoviejo and bahia de caraquez. i visited w/a man w/the MAAC in gye, and we discussed a much-bigger show.. when i want to study artifacts, i can go to the museums here in manabi on mondays and work undisturbed on their ‘closed’ day and he could arrange for me to do that elsewhere – only i stay very busy and haven’t made time for that. through those channels, and also through ‘walk up/cold calls/ i will be looking to see who could accommodate a workshop (a problem i’ve hit here) and after that we’ll set a date… it was always so easy to work with arts counsels in the usa, though working with the museums has been a very positive experience. Fascinating to hear about the museum work. 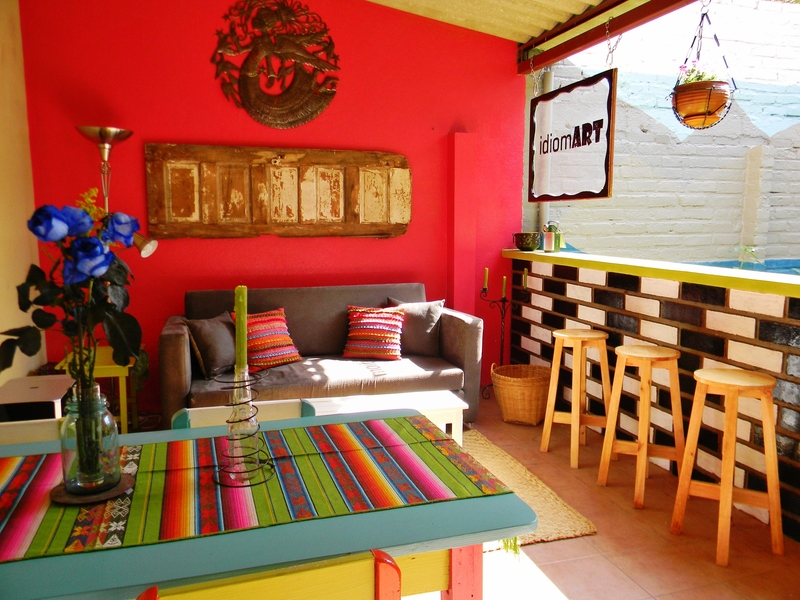 Here in Cuenca, there is a new place that opened about two weeks ago called “Case de la Vida.” It’s in Gringolandia–a community center that is offering art classes. Also, my friend here in Cuenca Laura Inks Bodine, directed an arts center for years in Santa Barbara, and she and her husband Clay are getting ready to open an arts center in el Centro. They’ve just rented a wonderful colonial building! I can put you in touch with either place. We are also friends with Tara, the director of Casa de la Vida. That all sounds great! would you believe that i’ve been in town all day trying to upload one video?!!! it has just under an hour to go! city vs country offer extreme contrasts at times! Bless your heart! I would believe that. I could never have even hoped to upload a video when we lived in Haiti. I remember the frustration of trying to upload a single image! Look forward to seeing the video! 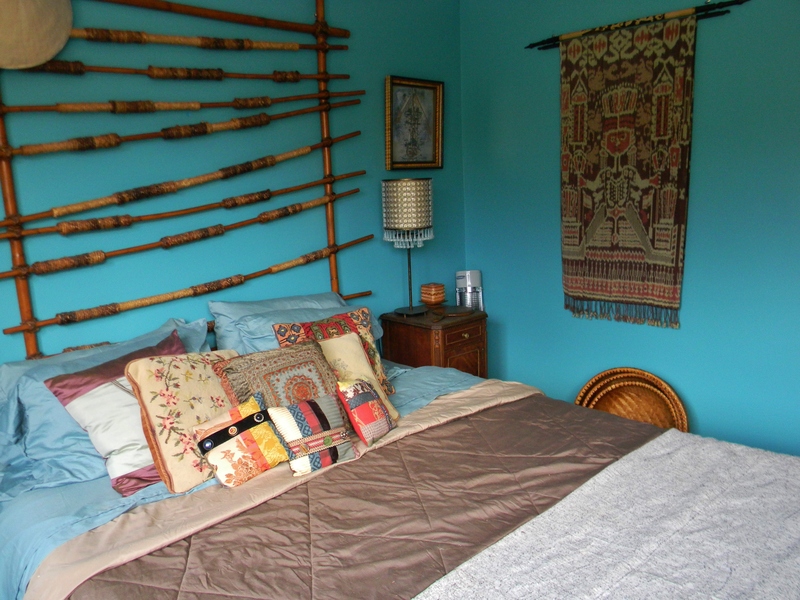 Beautiful, warm, cozy and wonderfully decorated! I love all the color. May your next chapter be filled with light, love, peace and new beginnings. We’ve relocated so often that recently no place truly feels like home. We are currently living in Puerto Rico and while the island is beautiful it is not without challenges when it comes to living here. I’m looking forward to our next move although the location is yet to be determined. I look forward to following your story. How wonderful to hear from you this morning! I’d love to know more about what it’s like living in Puerto Rico. We lived in Haiti for a year, and though they are geographically close–probably, there’s no real comparison. I’ve never been to Puerto Rico. 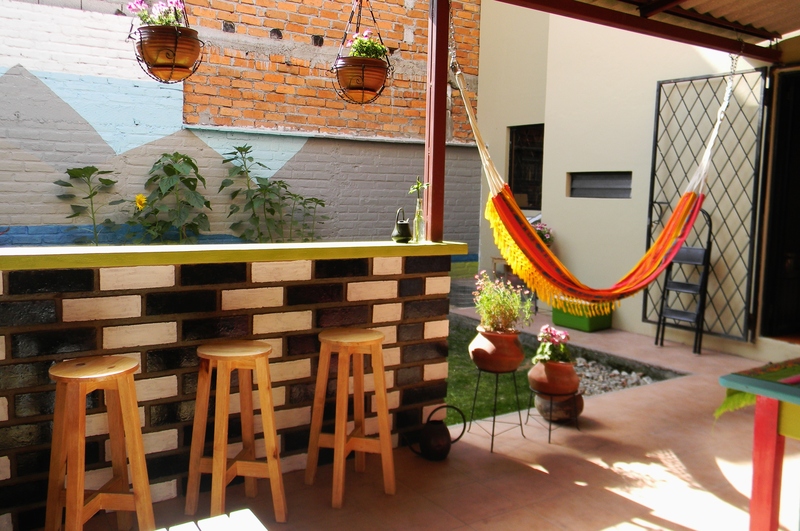 Check out Ecuador, if you’re looking for a new place. The cost of living is INCREDIBLE and the country is so amazingly beautiful! Hope you will stop by again soon. I’ll check out your blog, asap! 350 a month! Wow! I pay more for a week. I loved seeing your home. So colorful and reflects your personalities. And now you have a new member of the tribe. How fun. 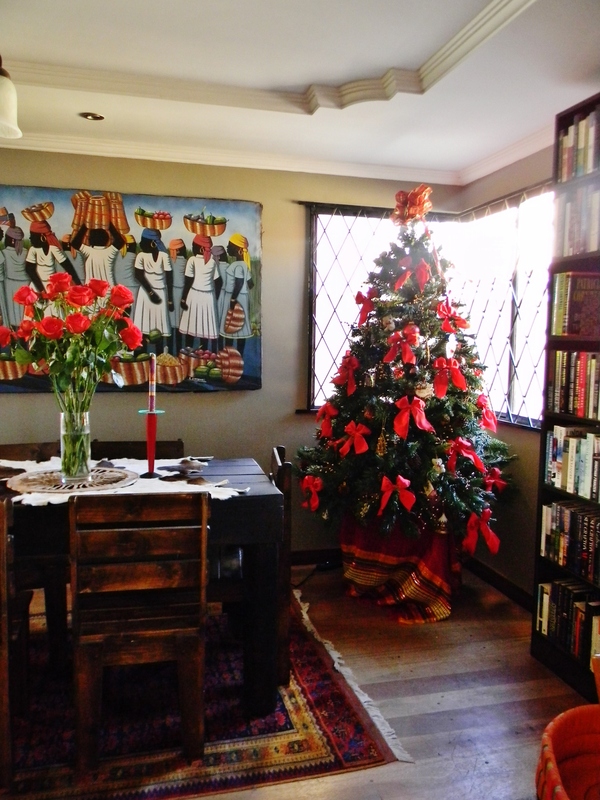 As for us, we are living in a small flat that we intend to keep for only another year. Then we hope to buy something. Might have to look in Ecuador. 350 a month! Sorry, I just can’t get over that. I know. The cost of living is incredibly low. And the country is stunningly beautiful. If one has the ability to make a living from anywhere and you want to live well, Ecuador has a LOT to offer. I know that London is incredibly expensive. Sara was the finalist for a job there, but the NGO offered it to a Brit in the end, so as to avoid having to get Sara a work permit. But we were concerned about what our standard of living would be like, since we would have to spend so much on housing. I haven’t been to London in more than 25 years. Great to hear form you today, my friend. Hope you are staying warm! I love the new place and think you’ve done a great job with the paint. I particularly like the way the paint job in your studio frames the art. It looks warm and cozy with beautiful light. I’m not sure I’d want to leave! Your nephew may have a hard time going home in 6 months. Have a great spring visit. Thank you, Lisa. I’m SO happy to hear from you and know you enjoyed the tour. We are delighted to have my nephew, and he may not go home in 6 months. I suspect, if he can find a way to stay, he may. Hugs to you–and PLEASE stay warm! LOVE your name. My Sara is a huge pork lover. So glad you enjoyed the post. Have a wonderful day. Hope to hear from you again soon. Thanks SO much for stopping by and taking the time to leave a comment! Just visited and subscribed! LOVED your blog. It might interest you to know that the pork here in Ecuador is really good–though, of course, we’d never consider eating YOU! Too cute!!! Snorticles right back atcha! Good morning Sweety, Wednesday is becoming very special to me when I seat at the dining room table with my cafe con leche……it would be even better if cinnamon buns were involved and read your blog. David and l love your home and being dear friends has made it even more phenomenal. Looking forward to many more causal and formal times together! Love ya girls! Oh, dear Juan, we love you guys, too. How blessed we are to have made friends like you here in Ecuador. It’s hard now to imagine being here without you! I don’t know when Sara will next make those rolls, but, I agree, they are awesome. Next time we come over, I promise to bring you a chocolate cake! Hugs to you both, my friend! Thanks for the share Kathy. My wife and I love following your lives in Cuenca. We really enjoyed our visit there last summer. The people and culture are a great fit for us. We explored some middle class residential areas, and thought them a good fit for us as well. Being about 3 years from making our decisions regarding the next stage of our lives, your posts are invaluable to us. We will return to Cuenca a few more times to check it out. We would love to meet you two. Be well. Hello Sara(and Kathryn)! My what a beautiful home you have! I pray that this new chapter in your life is filled with blessings.And as you have obviously learned,” home is where the heart is”. I have learned over the course of my life, that the physical surroundings(size of home)doesn’t really matter. It is the love that fills that home. I could live in a tent the rest of my life if I was with someone I loved. I will look forward to more pictures of this beautiful country. Yes, you are so correct. It’s love that makes any dwelling a home! I may not exactly want to live in a tent, but if I had to choose between a tent with Sara or house without, I would definitely select the former. Thanks so much for your comment. It’s wonderful to hear from you! As you know, we moved a few months ago, and gee, I love it. Our home is rather more ramshackle than yours 😉 but we are slowly making it our own. More than that, I feel as if we belong here. I’m not sure if this will be the last time we move house, but I can see us staying in this little city for a good long time. We live about 1.5 Kilometers from Mal Del Rio and arrived about the same time you both did. 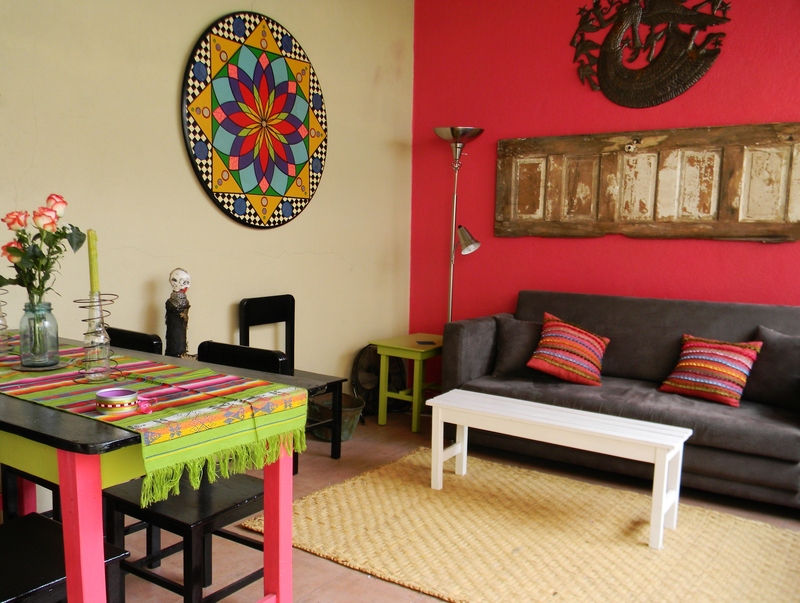 Instead of renting we bought a home across from the Trarque Rio by Circo Social. Our road has a name but it is not posted and we have a number on our house but it to is not posted. Both the name and house number can be found on the deed, but since you are renting you do not have that deed. 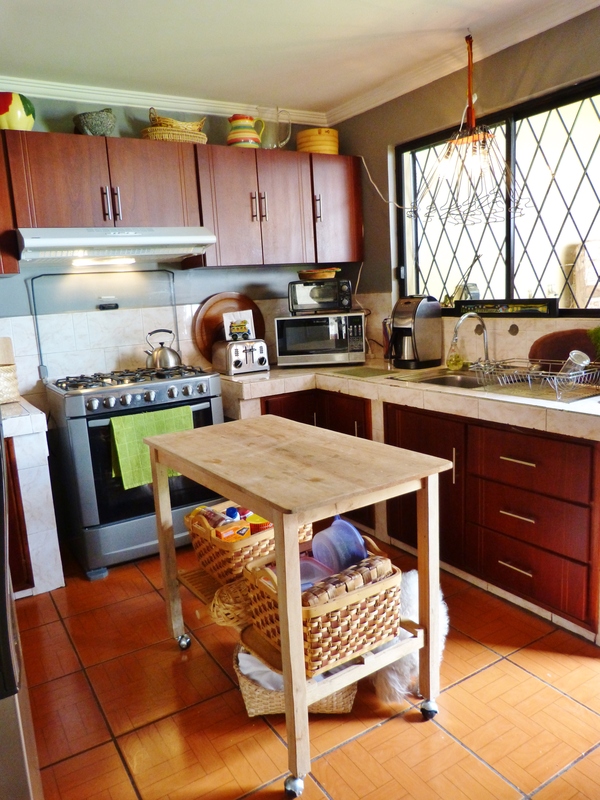 Lovely home I see a lot of similarities which are Ecuadorian – bathroom, stove to small for the space, etc. I had the spave between the stove filled in by a custom made spice cabinet. Oh, we love itz here, especially the weather. I think the bible missed the garden of Eden by half a world! Ha, LOVE it, Arlene! Yes, the Bible is geographically challenged! Hadn’t thought of that. Yes, there are quirks with regard to the housing, but nothing too bad. You are fortunate to have purchased. We may do that one of these days ourselves. LOVELY part of town you live in! Interesting to know that the house number is on the deed. I had no idea that was the case. So glad you enjoyed seeing our home. Thanks so much for stopping by and taking the time to leave a comment! Wow. I’m speechless. Your house looks amazing! Thanks so much, Heather! I’m glad you like the house! Great to hear from you, my friend! I loved the tour of your home. I cannot wait to see it in person. We can’t wait for you all to see it in person, either. Thanks so much for stopping by today, David!!!! Just absolutely lovely, Kathy! Thank you so much for the tour…I enjoyed it thoroughly. I agree with Jeff, this belongs on HGTV or a Home Decorating magazine, at least. Beautiful! You and Jeff are both so sweet to suggest the decorating magazine–though I’m not sure we’re exactly in that league. It’s still fun to think about! Hope you are staying warm up there on your little island! Wonderful to hear from you, Lannie! I LOVED your website. Your cabinets are exquisite! Also, I left a comment on the expat forum about how to find more affordable housing. The key involves not using a realtor, as then prices are jacked up. WE would love to meet you all one of these days! Hope you all get to Cuenca soon. If you have a child still in high school, then you are younger–like us! Hooray! Sara took all those books? … Meanwhile, love the art work!!!! Cheers to having your nephew there for the extended stay. Thanks, Frank. Yes, we did bring all of those books. I know. With e-readers we should be able to do without them, but we are still bound to the printed stuff–not pun intended. I swear! Hope you are staying warm and out of the snow. My sister said this morning that Lexington got more over night. It’s been a bitterly cold winter … and for now, no end in sight! Woo hoo … snow coming for tomorrow! Okay, I’m late getting to this comment, but stay warm, Frank! Considering that our house is about to hit the market – maybe as soon as tomorrow – I can’t say it’s a place I feel I could live very long, lol. But it’s been a pleasant enough 7+ years and felt like home during that time. I have to say, there is just so much to love about your house! 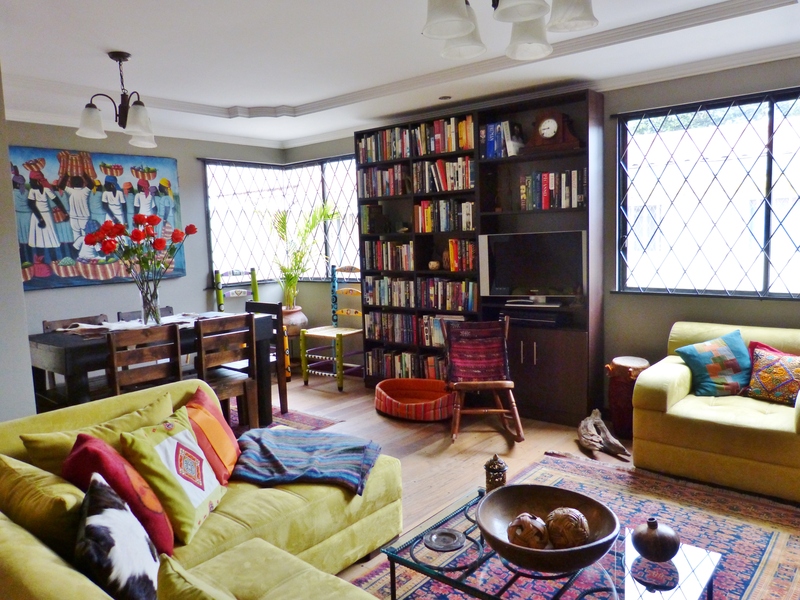 Everything, from the vibrant colors and stacks of books in Sara’s office to the mural of the Andes in the backyard – it’s all pretty awesome. You guys have such great tastes! Sorry you all are having to sell your townhouse. But maybe it will be fun for you and Tara to pick a place together once you get ready to buy again. I’m so glad you like our house. I think books help make any place feel cozy. Thanks! What a lovely home you have…the warmth and love is apparent in all that you have shown us. Thank you, Charles. Such a sweet thing to say. Hope you are having a wonderful week! Beautiful! I love the painted furniture, the colors, and the Georgia O’keeffe red pop. Growing up in the Southwest this of-course appeals to me. 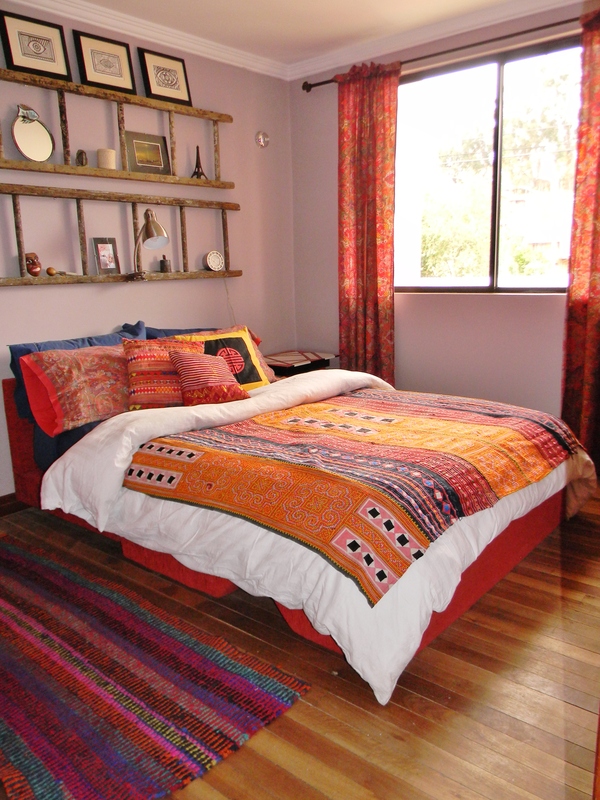 But it’s not over done Southwest with the mixed in green and soft quilts. The ladders for bookcases are an idea I’ve considered and I can see now they just might work. I have just one question–where is the dog hair?? Oh, my dogs produce ONLY invisible hair! Okay, invisible to cameras. No, actually, it’s everywhere. The only good thing is that only one of our two dogs sheds. Our female is a Maltese. So glad you enjoyed the house. Thank you! Yes, try the ladder thing. It’s fun! Oh my days…wow…absolutely gorgeous..you guys are fantastic…. Thanks so much, Michael! I’m ticked you like the house! I appreciate your stopping by and taking the time to leave a comment! 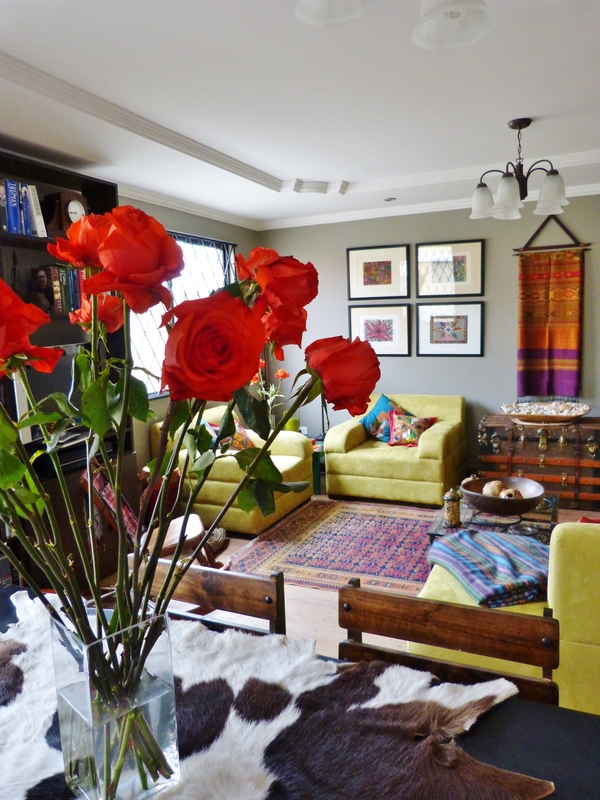 Kathryn and Sara – your home is absolutely beautiful! Among other things (everything!) I love the Haiti artwork and photos throughout. 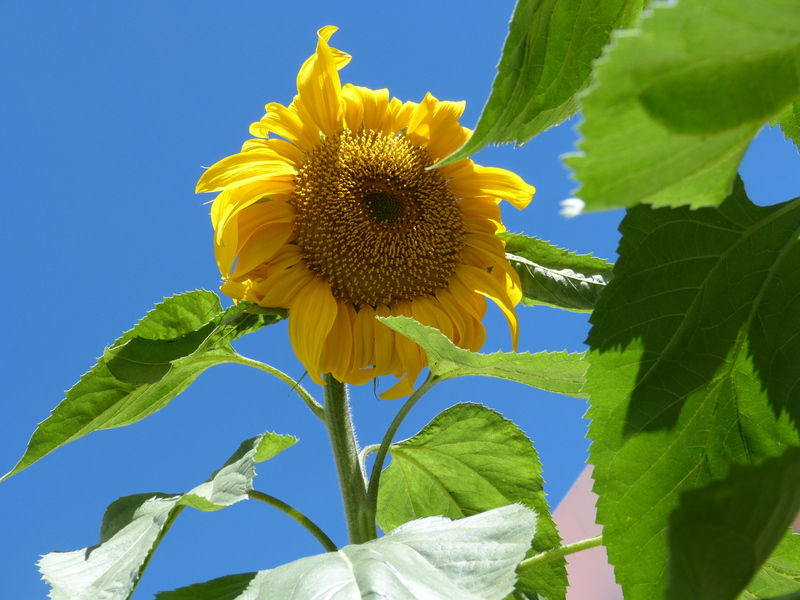 Your blog and photos warm my heart. Thank you! How kind of you. 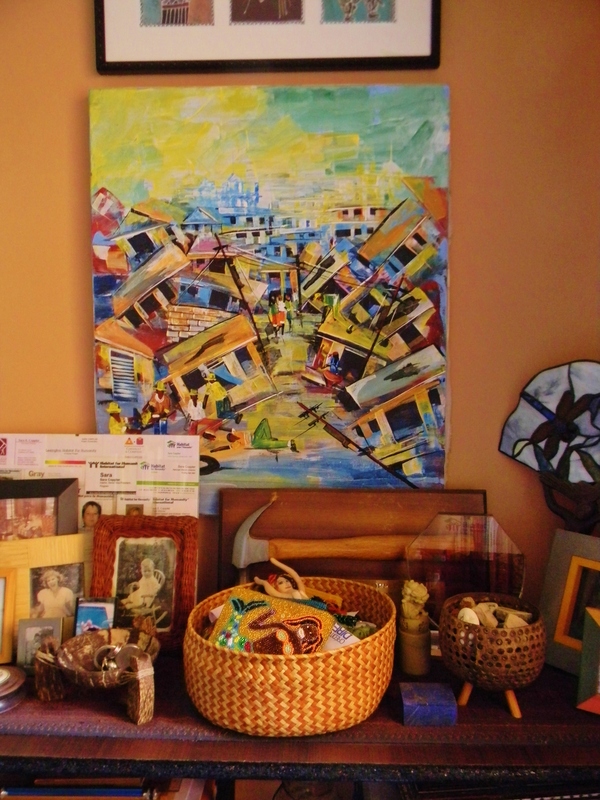 Glad you can appreciate our home–and totally cool that you like Haitian art! Thanks for stopping by and leaving a comment It’s wonderful to hear from you! Thank you, Kate! It’s wonderful to hear from you. 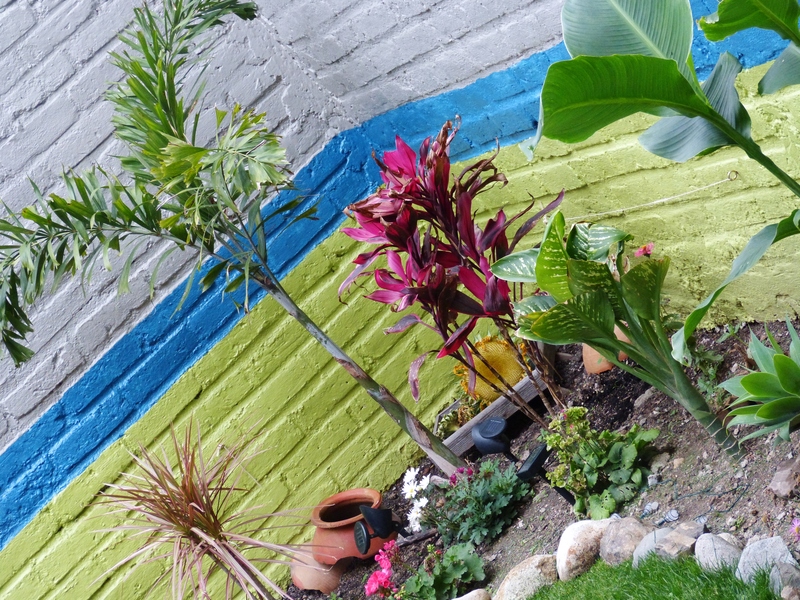 Love that you are considering a move to Ecuador and hope to pursue your love of art. And thanks for noticing my studio. I do mostly collage and mixed media. 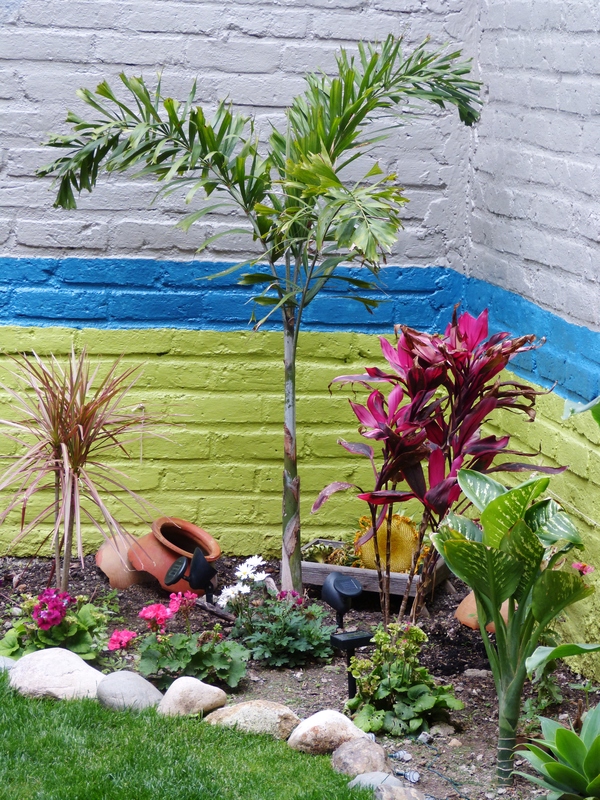 The huge round piece of art on the wall of our patio, the one that looks like an abstract flower, is a piece that I did. Hey, do my glasses need to be steam cleaned or do you have a new template? Very nice. Very sleek. Thanks, V! Yes, I have a new theme for the blog. I was getting tired of the old one, had been using it for like two years, if not more. I really wanted one that allowed for a larger photo display. Of course, you ALWAYS make me laugh! I think also that Ecuador is bound to beat Canada–especially in terms of the climate! Not to mention cost of living! LOVE hearing from you! I will mention to the dogs that you enjoyed seeing them. I’m sure it will make their day! I absolutely loved the vivid-color, eye candy photos you shared. Oh my gosh — exceptional! Thank you for the virtual tour of your home. Clearly the beautiful-toothpaste-commercial smiles are in your family’s genes as evidenced by the great photograph of you and Johnny! Thank you, Laurie! I’m glad you enjoyed the tour. I wish I had Johnny’s teeth, but my sister told me just this morning the fortune invested in that smile. Great to hear from you today. Hope you are staying warm! Nova Scotia is my adopted home and I love it here (in spite of the horrid blizzard that is currently raging outside!) Love the ocean, the sparse population and tides on the beautiful Bay of Fundy. Glad to hear that the second guest room will work for you. When will you be arriving? Sorry you are having a blizzard, but, goodness, it sounds cozy to me. Hate to say it–the climate here is pretty much perfect, but I kind of miss the snow. Great to hear from you, Sybil. Hope to hear from you again soon. We’ll keep the light on for you! oh Kathy, as much as I loved the look of your home in Kentucky, I LOVE this house even more. it has such a happy energetic feel about it. The more you tell us about Cuenca, the more I see us moving there. oh my! Yippee! You made my day, when I read this comment. So glad you enjoyed seeing the house. Cuenca is hard to beat, so we hope you will make your way here once your year in Europe has ended. Your room will be waiting. Let us know when you plan to visit! you are beyond gracious. We are pretty excited about coming down to see you and exploring moving there. 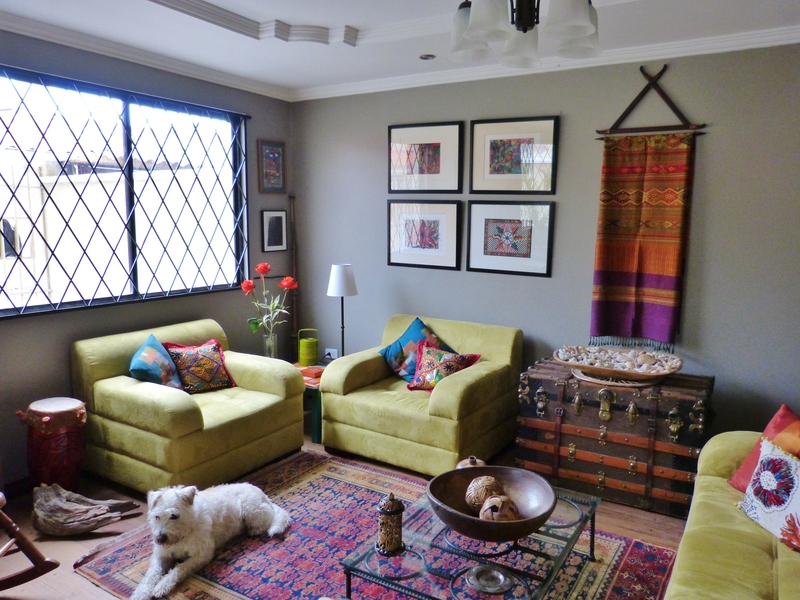 Thank you so much for sharing all the photos of your beautiful home – it has the feeling of a life being lived well, and all the colors and textiles are so wonderfully vibrant and alive. Absolutely gorgeous, and lovely. Thank you SOOOOOOO much! Glad you like the colors and textures. Your comment is SOOOOOO sweet. LOVE hearing from you. Hope your week is going well! Thank you, MJ! Glad you are feeling well fed! Great to hear from you. Stay warm. Hope you are not freezing! Oh my heavens I’m in love with Johnny’s smile!!!! 🙂 Hugs from a happy to see your happiness and home friend. Oh, Colleen. Thank you! I mentioned to my sister this morning the comments about Johnny’s smile, and she emphasized the amount she had invested in it. Yikes! She’s happy to hear that folks are able to appreciate it! We DO hope you and David will visit one day soon! Your room is ready and waiting. Just let us know when the price of airfare looks about right. We’ll keep the light on for you! Miss you! Hugs from both of us to both of you! Oh, good. I’ll keep tempting–and leave the light burning for however long it takes. Kathy, I just loved this tour. I’ve been dying to see all your rooms and how you’ve decorated. 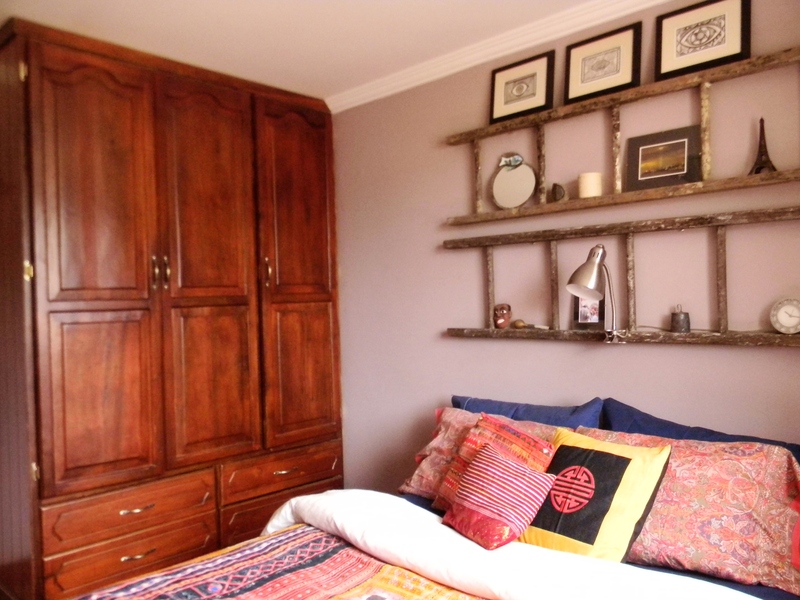 I especially loved the ladders-turned-shelves in Johnny’s room. How exciting that he’s staying with you for 6 months. You have such a terrific decorating sense. Everything looks like it was made to go together so beautifully even though I know that you’ve picked up your treasures from different places around the world. Do you plan to stay in this house for a long time or look for a house to buy? Thank you, Jackie. You are right. Collected the stuff from everywhere, but Sara has a knack for putting it all together. We will probably stay in this house for another year or so. Don’t know if we will buy. More likely we will build. It’s hard to not want to rent here, however. Rents are so low and, unlike in the US, renters had paint and make other changes to the house. We’ll see. Hope you are staying warm, my friend! Greetings to Reggie! That place is adorable!!!! It truly makes me want to switch gears, but I’m too chicken! I’ll have to live vicariously through you…. Oh, Tia, you are welcome to live vicariously. We are happy to share! Didn’t know you were in Indiana, however. Where? We were living in Lexington, Kentucky before we moved here. 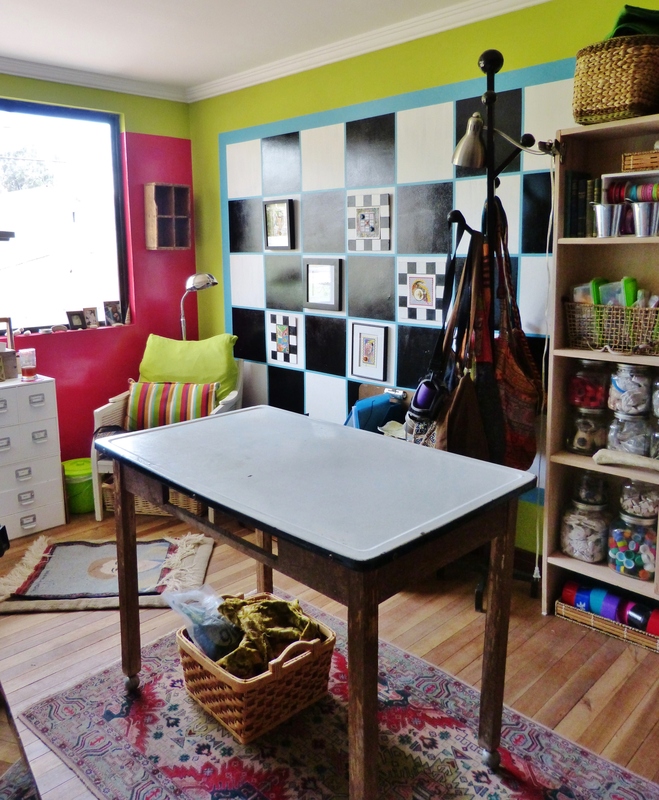 Hi Kathryn – your place looks fabulous! 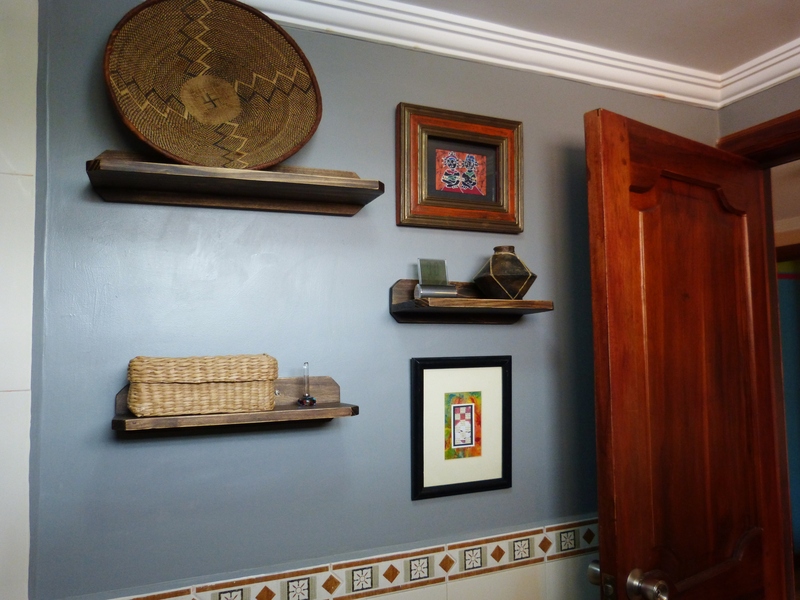 I’ve been trying to decide what of my art to take (it’s had to leave anything behind) and have been concerned about being able to hang paintings on the masonry walls – but I see that you have hung a bunch! Are there any issues, especially when you leave – is patching and repainting enough or do you have to re-plaster the wall? So great to hear from you, Alan! We have had no issues hanging our art. Yes, you need a drill and anchors for your screws, but it’s not hard to do. We hung all of our stuff ourselves. When we leave this house, we will patch the holes and paint over the patches, but not re-plaster. But we repainted before we moved in, even thought it had been newly painted. Thus, we have the paint to match what is here. Thanks so much for your comment! Great to hear from you!!!!! WOW – you must be spending hours to answer all of the notes to your post! Good for You, and thank you for responding to my question. No need to respond to this post! Thank God someone noticed. It has taken HOURS! Kathy, your place is stupendous! I love the colors, the creativity, the simplicity, all of it! For the first time, I can picture myself living there. But if I did, I’d want to be your neighbor and I’d want you to help me fix up my little house. Ooh, it’s so nice! Lucky you and Sara. Lucky nephew for getting to spend six months with you. You adventurous spirit is inspiring! Just let us know if you’d like to visit. We will leave the light on for you. And should you ever decide to move here, we would locate you nearby, and it would be a BLAST to help you decorate. Gosh, you know the language already. And after the prices of California real estate, you will have a fortune to spare! Hope your week is going well, Monica! I have lived in one home for 40 years, Kathy! LOL! I can’t even begin to imagine elsewhere, but I so admire you for being such an adventurer! Your home is just fabulous. I love the artwork and the colors and the overall sense of vibrancy. Thank you so much for the time it took to upload all those fabulous photos, and I am really pleased for you and your nephew to have this experience together. At his age this is just the beginning of many such adventures. He’ll learn so much from you and Sara! Just wonderful! Oh, thank you. Can’t tell you how glad we are to have Johnny here. And how wonderful to have lived in the same home for so many years. You must love it! Glad you enjoyed seeing the art and all of the photos. Wonderful to hear from you! LOVE hearing from you! Thank you! So glad you enjoyed the tour. And bless you, as well! Hope you will stop by again soon! What a feast! I knew you’d make your home a thing of beauty and love! I’m homesick for it. Thank you, dear Sandy! I suspected you’d enjoy seeing these photos. Hope you are feeling better–and staying warm. Not a nice time of year to be sick! Great to hear from you! Kathy, there is so much color and flavor and beauty in your home. And books! 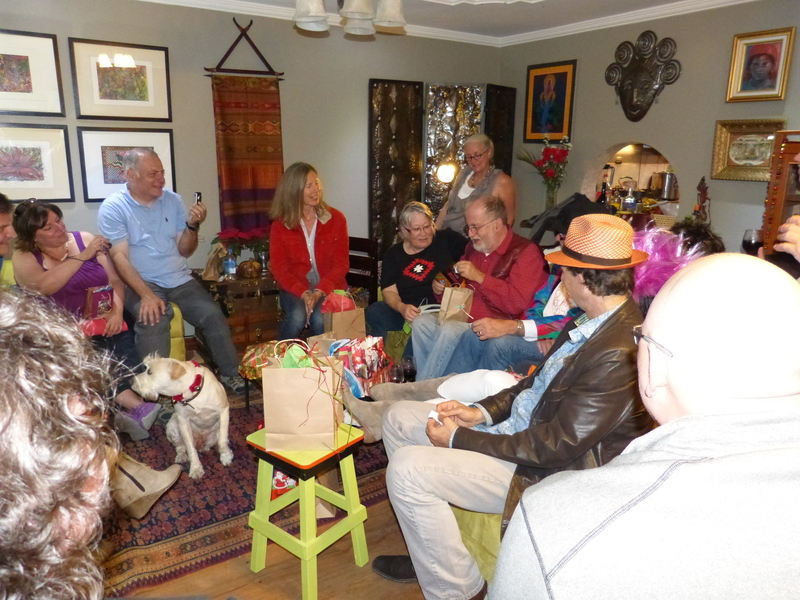 I am stunned that you were able to transport so many of your beloved things down to Ecuador. Your house makes me smile and say, yes, artists live here. Creativity and art and color abounds. Our style is very Zen, simple, minimalist. Yet I adore visiting people who celebrate their love of life like you and Sara do here. Kathy, you’re a sweetie! Glad you enjoyed seeing our home. Yes, we shipped a 20 foot container here, mostly so we could move our books and art. We just couldn’t stand to part with them. Wonderful to hear from you. Hope you are staying warm! Gosh, sorry you were denied yesterday. I have no idea what the problem might have been. This one got through, however. Thanks for trying again! Hope your week is going well. Glad you enjoyed the tour! Great to hear from you! Kathy, I’ve been following your adventure for a while. I thank Monica for introducing me to you. I love how you’ve made the house, your home, with your stamp on it. 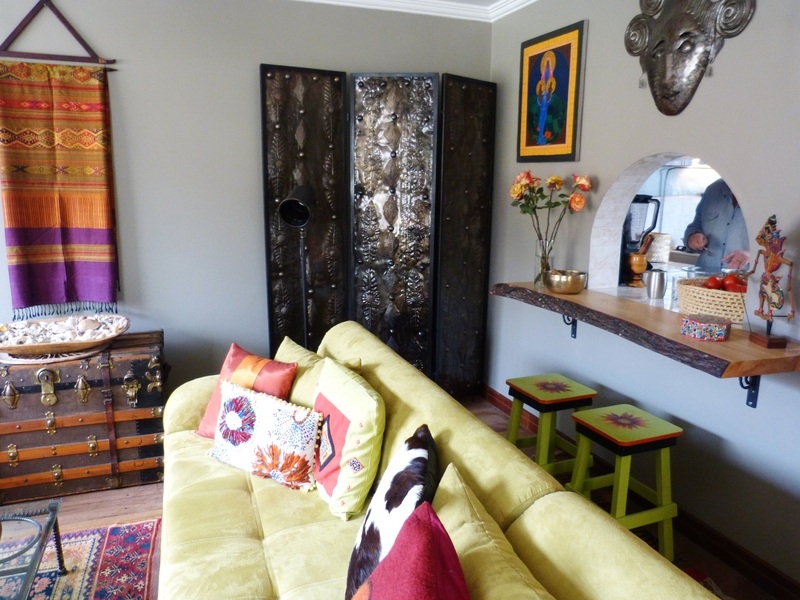 I love color, with the beautiful wood tables and simple pieces that make your home so inviting. A place that is pure and serene. Books, I love books, seeing your library space, reminds me of mine. Btw, I too found out on my recent trip to Costa Rica, there are no house numbers – I absolutely loved that. I did not know Sara worked as an international aid worker. What a wonderful career. Did she visit Sri Lanka by any chance? we were terribly ravaged. I was born there, grew up in Australia and now live in San Francisco. If I had my wish, I would settle in Florence. We travel with our young children whenever possible and I would give them the world if I could afford to travel every year. I left my heart in Tuscany. I could see myself there, easily. There is a piece of me that is strongly Mediterranean and I cannot explain it. Oh, thank you for leaving a comment! And thanks to Monica for the introduction. I’m so glad to know you’ve been reading! In fact, Sara did work in Sri Lanka–quite a bit, actually. She directed Habitat for Humanity International’s response to the tsunami in the 4 most heavily damaged countries–Indonesia, Thailand, India, and, of course, your country. I remember her once being in the Colombo airport when there was bombing nearby that I reading about online. Scared me when she went there, but she says it’s such a gorgeous place with people she came to love. Fascinating to know you are from that lovely island! Thank you SO much for leaving a comment. I must now visit your blog! How fun to meet you! Gosh, thank you so much! What sweet things to say! Glad you enjoyed the tour. We love our home, love to entertain, love to have visitors from far and near. I appreciate your stopping by and taking the time to leave a comment! Beautiful! Love all the colour you use!! Thank you! So glad you enjoyed the post. It’s wonderful to hear from you. Please stop by again soon! LOVE LOVE LOVE your home! you and Sara always have the most gorgeous homes. You both have a knack for decorating. How wonderful your nephew has come to live with you! What will he be doing? Thanks, Nicole. So glad you like the house. Johnny hasn’t yet figured out what he’ll be doing. Probably, studying Spanish, for one thing. Great to hear from you. Hope you are staying warm! Thanks, Nicole. So glad you enjoyed the tour! Hope you all are staying warm. I think about you during this sub-zero weather. I have to go to work soon so I will revisit this wonderful blog post. 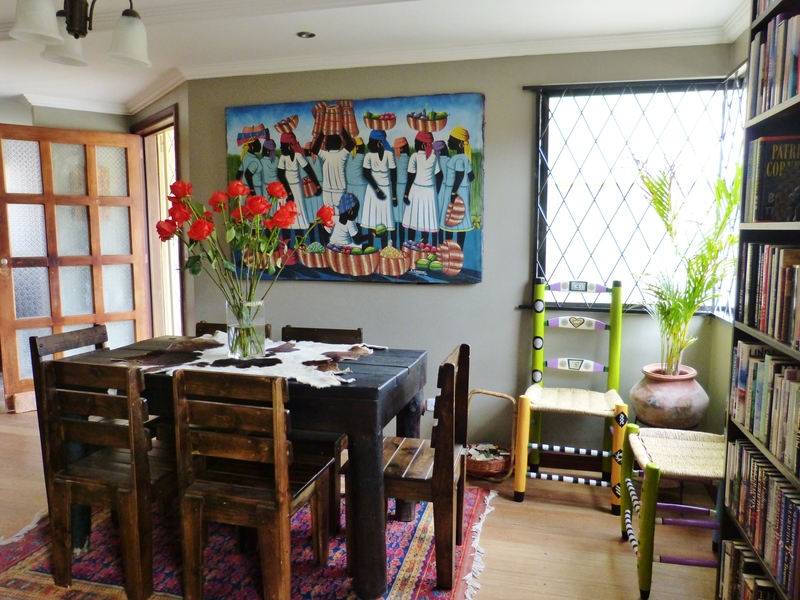 You’re house is so lovingly and artistically arranged and decorated ..in an organic way! Love the colours and different art pieces. My home becomes more my home when I do have some art pieces that I’ve made and I’ve bought..but my place, is not as wonderfully arranged as yours. In fact, I feel the slight burden of my “stuff” , of acquisitions because it’s split across 2 Canadian provinces. Thank you, Jean! We love our home, too, to be honest, but it always feels good to know that others see a bit of what we do. I appreciate your taking the time to stop and leave a comment on our way to work! Thank you for the tour, Kathy. You seem to have a rich life — in the simplest and most beautiful ways. 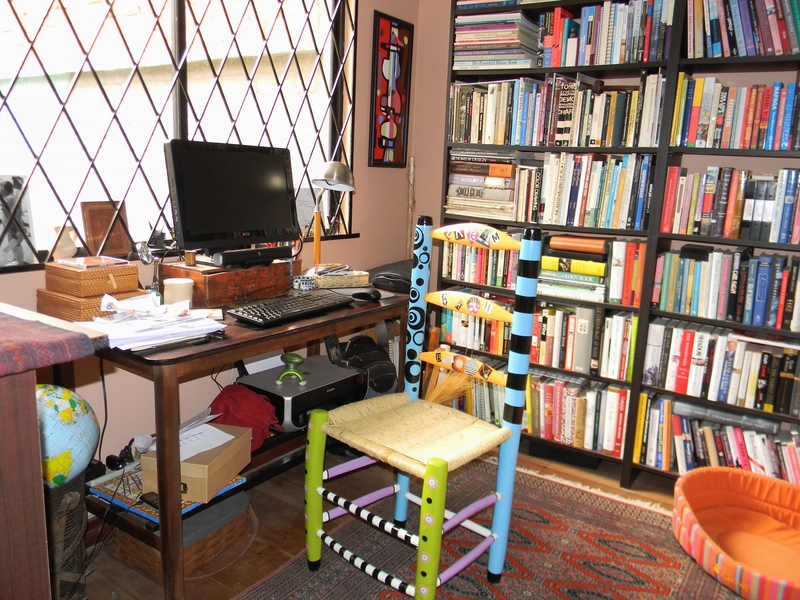 I love the floors and the chairs, and all those books. It sounds as though you’re really home. I’m so glad you like the house. Thank you. We appreciate your stopping by and leaving a comment. And I hadn’t thought about it exactly, but our life is kind of rich. Great to hear from you! Your home is so beautiful, Kathy. It appears to be decorated with love. I don’t suppose I could get you to visit and help me out with mine? It’s still chaos here after eight months. Oh, I’m so glad you like the house. It takes time, Robin. Remember. We’ve been in our house 8 months, but we haven’t had the kind of construction and renovation projects you have. That makes a huge difference! Would love to help you! Hugs, my friend! Thank you for sharing. You’re home is so beautiful! Thank you SO much. Glad you enjoyed the tour. Wonderful to hear from you today! 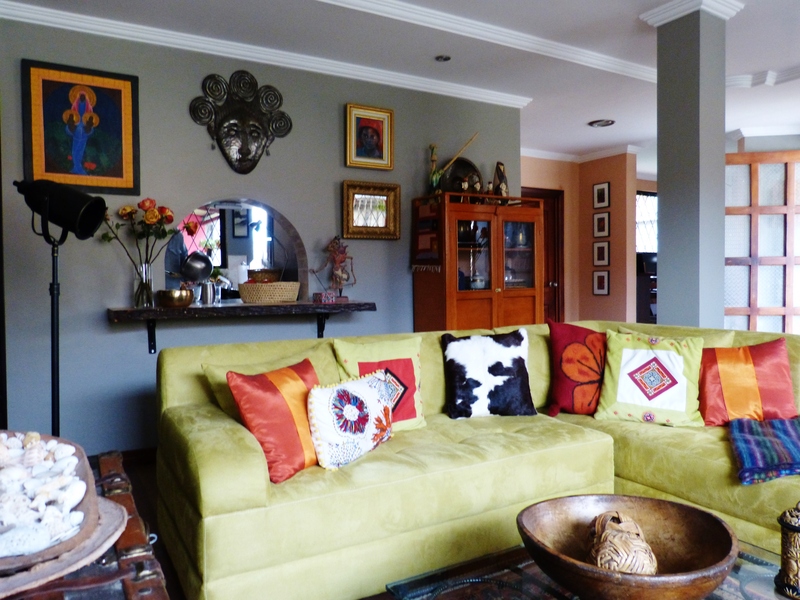 Thank you for sharing your absolutely beautiful home with us – beautiful because it is so obviously well-love in, the colors and objects show the joy, warmth, humor that surrounds you all in your environment. What a sweet thing to say! I think you may have a point, actually–that love and kindness sometimes come through in the way a home is decorated. LOVE that notion. Great to hear from you today! Thank you, Betty. My nephew is a sweetie. We were walking down the road in Cuenca last night, and he discovered a woman with a flat tire, so he stopped to change it for her. Neither Sara nor I had even noticed the poor woman. So, yes, we are blessed to have him. Glad you enjoyed the tour! Stunning, Kathy, just stunning. 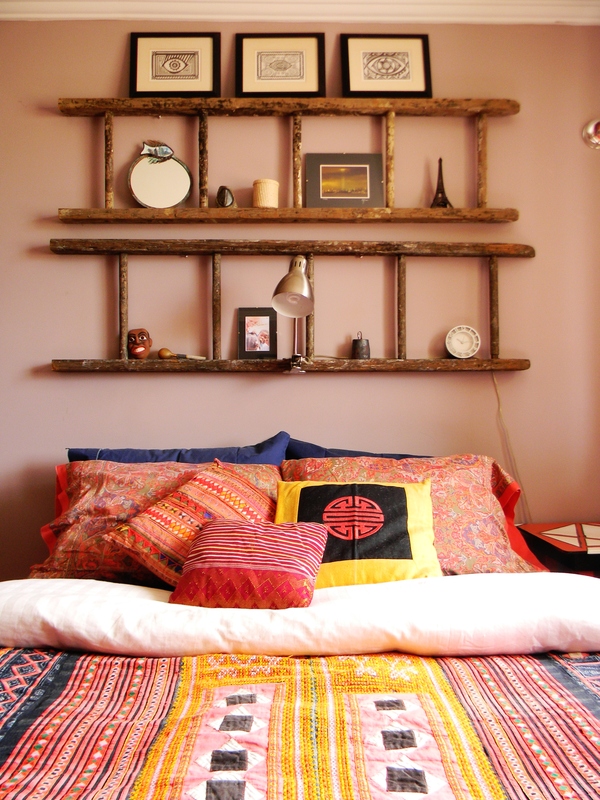 –The vibrant colors and creative decorations — ladders hung on the wall horizontally, serving as shelves — who knew? All set off by a dozen red roses in the foreground, and the sweet dogs that make a home a home. 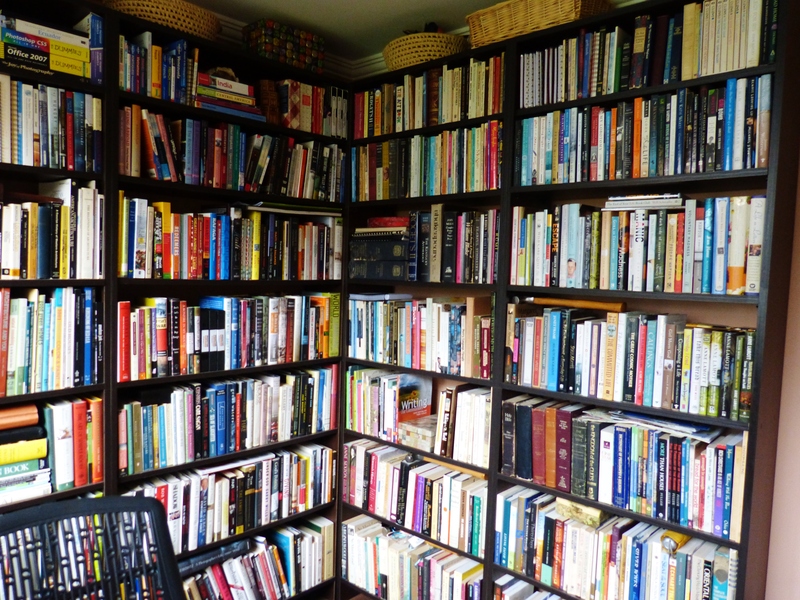 The best, though — I love, love, LOVE Sara’s library in her office, or may it’s your joint library. As for my roots, I don’t know at this point. I love my Victorian home; I love having lots of rooms — 4 bedrooms, full dining room and large kitchen. I could live in a castle and think of something to fill every room. So, this keeps me in Delaware, because it’s affordable here. But, based on my current income, Cuenca should be my goal of where to spend the rest of my life. Since I spent most of my adult life in Redondo Beach, Calif., I still think of that as home — but I’d be lucky to afford a closet there these days. So, recently I have been thinking about where I want to wind up. Thank you ever so much for this beautiful and thought-provoking post. Thanks for the sweet comment, my friend! Listen, given your recent post, you might think about Cuenca. Should you want to visit, please let us know. We have a guest room with your name on it. And should you ever want to move, we would, certainly, help you get settled! Hang in there. I’m thinking about you! Thank you, Kathy. This means a lot to me. A guest room with my name on it — wow. I am seriously thinking about it. I don’t want to leave the U.S., but I don’t want to live under so much stress, either. Besides, I speak a little Spanish, and I love the mountains and high altitude. Just let us know should you decide to visit. Look forward to meeting you!!!! My goodness. 350.00 coins? That’s smack dab unbelievable! If I wasn’t with boyfriend, I’d pack up soon as you could shake a leg and bat an eye. Though, I’m not close to retirement, so I’d need to work and whatnot. I don’t speak a lick of Spanish either. It is Spanish-speaking over there, right? I know. It’s an amazing price in the mind of most North Americans. It has become more normal to us now, but the cost of living was one of things that drew us to Ecuador. Should you ever decide to visit, let us know. Yes, Spanish is the national language, but one can get by without, if need be. I know a number of expats who don’t speak the language. My Spanish isn’t all that good. What a beautiful home you have made! It is great that you have been made to feel so welcome there. I feel equally at home in Australia and Italy. I love both places. It’s wonderful to feel at home in more than one country. I don’t know that Sara and I necessarily ever want to go back to the US to live, but it does feel like home, since our families are there. Hope you are having a safe trip back to Australia! I ADORE all of the photos & numerous books! You are such a sweetie, Kimmy! We love our home. Glad you can appreciate the color. And I love to thing of it as magical and poetic. Such great descriptions! Thank you! I love the photos. I feel like I’ve visited you and want to come back! SO inviting. I can’t believe the cost thought! That’s outrageous considering how much we pay here. Isn’t that the truth!!!!! The cost of living here is a fraction of what it is in North America. Where are you from. I’m delighted you enjoyed the tour. Thanks for stopping by. Wonderful to hear from you! How beautiful! 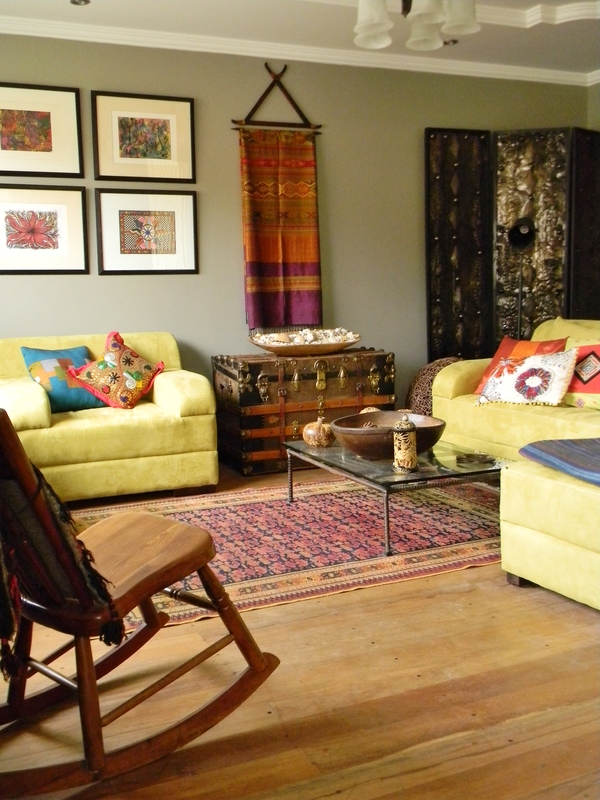 I love the color, the artistry, the way you and Sarah have made this house your home. And the cost of living! Wow! My husband grew up in Venezuela and he often talks of moving back to where we can afford to retire. 😉 He also talks of the postal systems south of our border, no street addresses, and how mail is–or is not–delivered! Thank you for sharing a part of your world with us. Hi Cecelia! I’m so happy to hear from you! Had no idea your husband was Venezuelan. Interestingly, the post I just published is about Ecuador, but also about I trip to Caracas I took with my parents as a kid. You might appreciate it. So is school over? Are you blogging again? 🙂 Yes indeed! I’m back (mostly). I graduated Dec. 31, but am taking two courses that Ohio requires for licensing. Start my new job (adult mental health counselor) on Monday. I’ll check out your latest blog. My husband grew up in Caracas. Wow, wonderful to have you back, and congrats on graduation and the new job! Good for you!!!!!!! WOW! Your home is beautiful (I wish you could see my face when I read the price). I love the library! Also I love all your bright happy colors. My home is the same way! Ha, ha! Wish I could have seen your face, also. 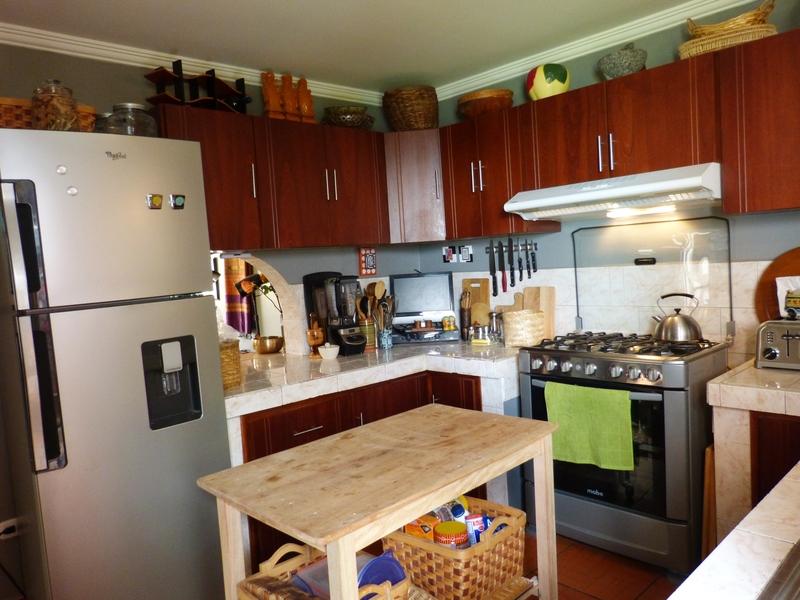 The cost of living in Cuenca is incredible compared to most of North America. Glad you enjoyed the colors and the tour, in general. 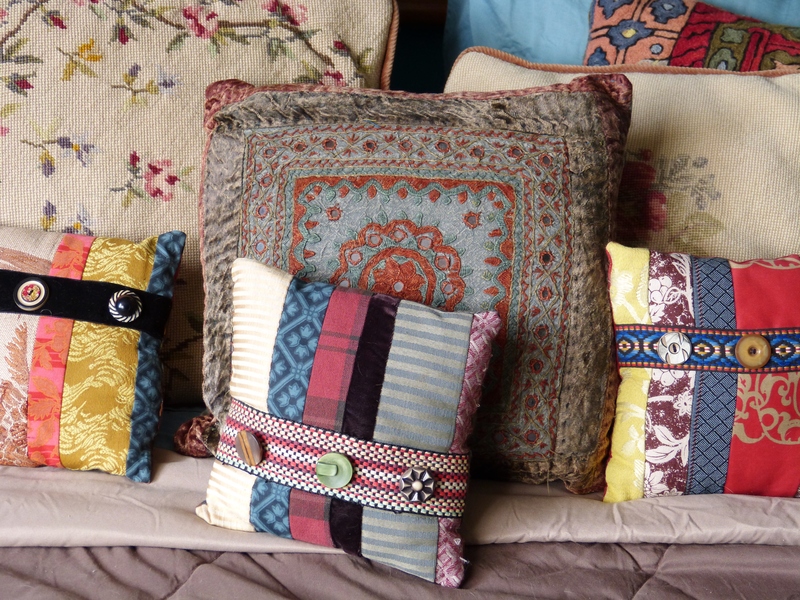 Fun to hear you decorate with bright colors, as well. Hope you will stop by again soon! I salute you Kathy. Look at all these comments and you’ve answered every single one of them with more than one sentence. Thanks so much, Rosie! How wonderful it is to hear from you. This post was fun to put together and it was SO fun to see response it got. (Yeah, that meant LOTS of comments to respond to.) I will mention to Sara how much you enjoyed the books, as well. Hope you’re having a good week so far! Kathy, your home is so colorful and welcoming! After 25 years in our house, I still feel that it’s never quite put together. I wish I had your eye for decor and design! 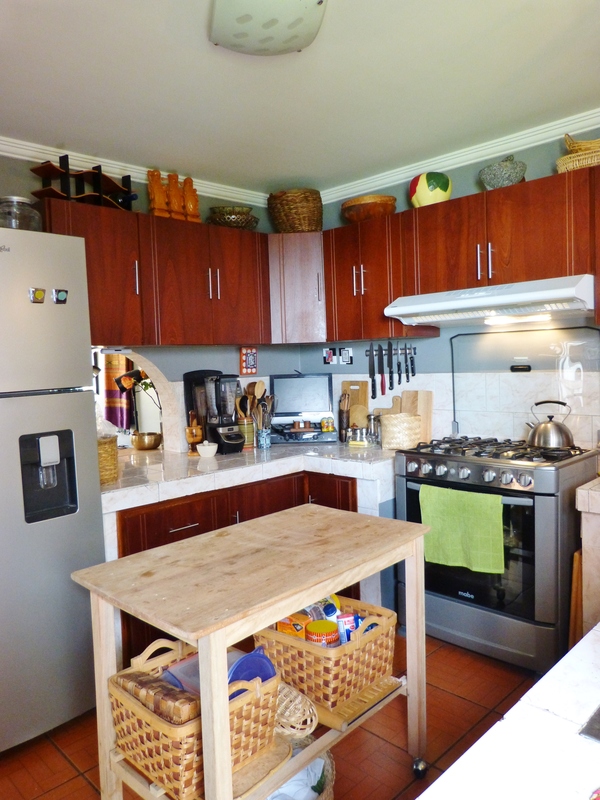 Is that a cookie jar shaped like an apple I see on top of your kitchen cabinets? If so, my mom used to have one just like it. It was probably my grandma’s at one time and my sister now has it. I’m so glad your nephew is with you now. I’m sure there will be many adventures to tell about during his stay. Good eye, Terri. Yes, that IS a cookie jar shaped like an apple. It belonged to Sara’s mother. Interesting to know that was one floating around your family, as well. Glad you enjoyed the post. Hope you are staying warm. Thanks for stopping by. Wonderful to hear from you! It’s so wonderful to hear from you, Sue. I’m sorry to hear you are having to work so many jobs in retirement. That doesn’t sound fun, at all. I think you would find a number of women here who are in your same situation. Seems they have quite a sense of community, so many of them facing an international move alone. And honestly there are a number of affordable places to rent here. You would not have trouble finding a place comparably priced to ours. Yes, you might want a condo in a high rise, at least for security, but that is not hard to find. Let us know if you ever decide to visit. And please stay in touch! Hi Kathy, I will be watching your blog and links, really enjoying reading your posts/sections and Sara’s daily pics, spent waaay too much time last night on them, lol… i don’t care if its a condo or a rental house or apartment,(in good condition & naturally in a safer area). The cost will be my concern, Its good to hear that there is a good possibility for a nice little place under $300, thanks for that spark of hope! I will certainly be in touch! Oh, good! Thanks SO much for reading and commenting! There is definitely hope and community! Thank you for sharing your home with us. It is so beautiful. I hope to find something akin to this when I come to EC. How far are you from Cuenca and is it necessary to have a car to get there into town, or is there bus transportation? Thank you so much for your comment! 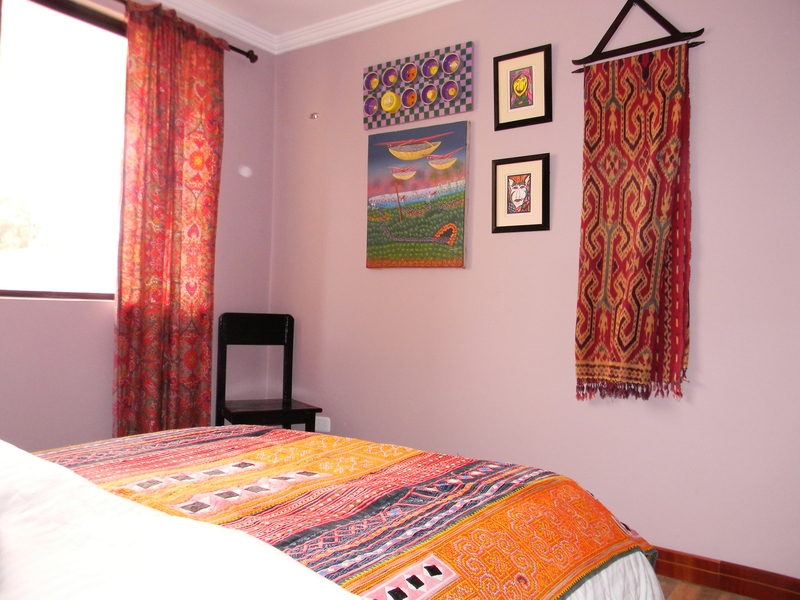 We live in Cuenca–about a 10 minute bus ride to el Centro and just south of the Cuenca airport. NO, we don’t have a car. Just don’t need one. We have buses that we can catch within about 2 blocks of our house. And buses run about every 5 to 10 minutes. Bus rides cost 25 cents. Great to hear from you today. Hope you will, indeed, consider a move to Cuenca. There are a number of places that are similarly priced. Oh, that is so wonderful to know! I can’t wait. Hoping to be there by end of summer. I look forward to meeting you! Let us know when you arrive!!!! WOW! 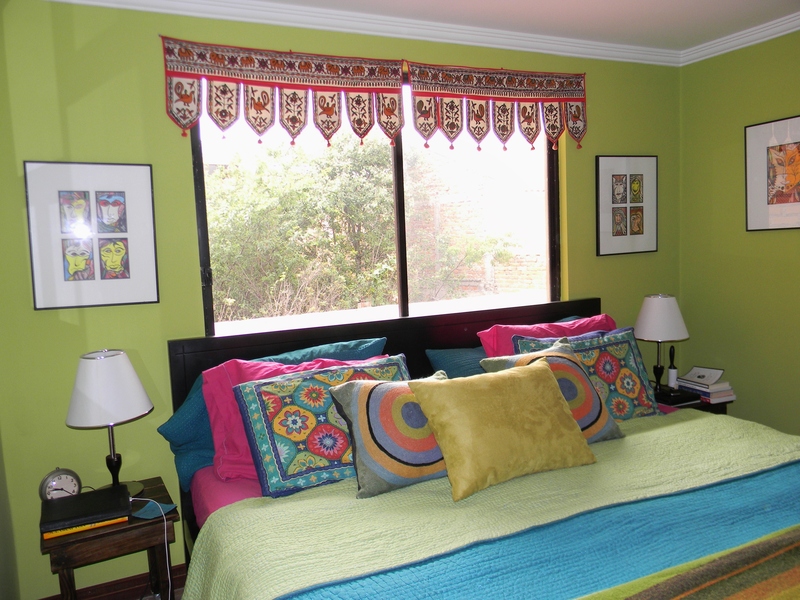 The light quality through all of the rooms is crystal clear and makes those gorgeous bright colours inside come alive. I envy your massive bookshelves, they look full of incredible titles to enjoy. Your nephew is a lucky chap to have a brilliant time in Cuenca. I’m pleasantly shocked how reasonably priced this high quality property is available for. I love your posts Kathy, it’s inspiring to learn about your Humanitarian work, here’s to you stars! Oh, Lita, you are a sweetie. Thank you for your kind words. We love our house and our bookshelves, as well. 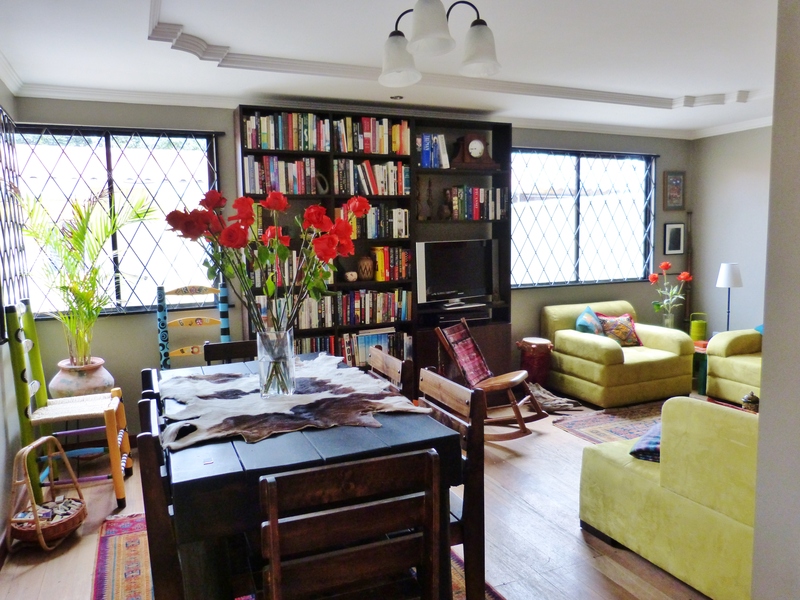 We moved all of our books and art to Ecuador. We just couldn’t leave behind the things that make our house a home. And, yes, the prices here are insanely affordable, which is part of why we’re here. We like the ability to make decisions that aren’t economically-based. Living here allows us to do that. Hope you are well, my friend–having a great week. You are, truly, sweet! LOVE hearing from you!